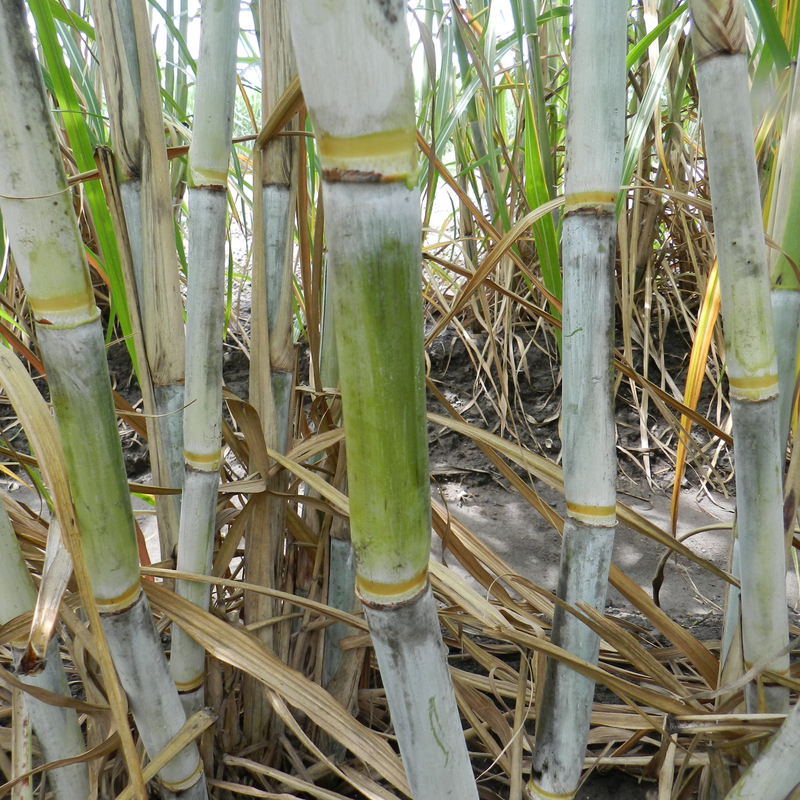 and placement of certain varieties from companies that are selling disease-free sugarcane seed cane. 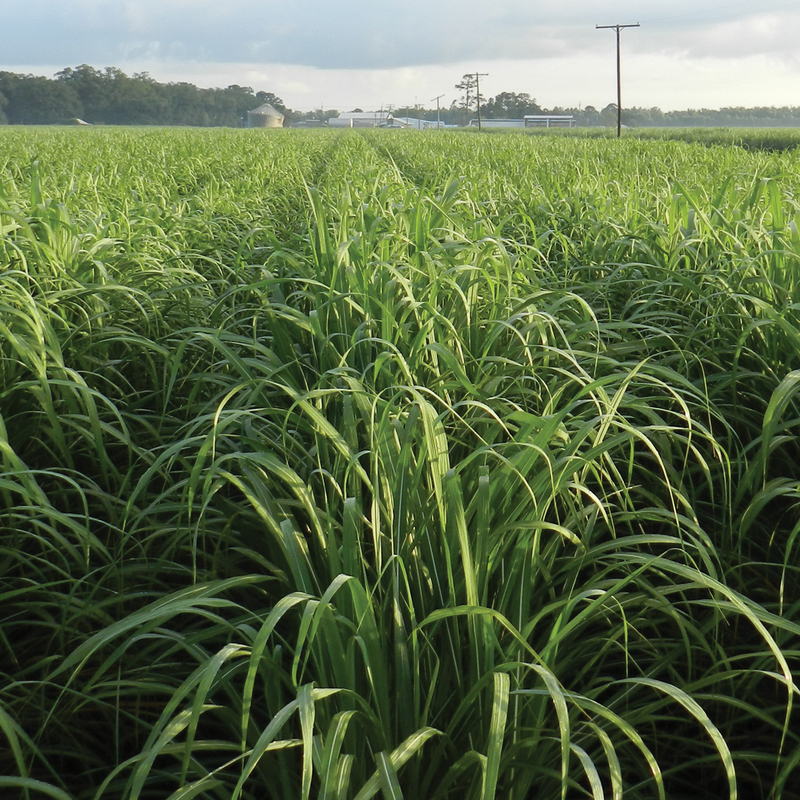 This publication is designed to help people identify commercially grown sugarcane varieties in Louisiana. The following varieties are planted to some extent in Louisiana: HoCP 96-540, L 99-226, HoCP 00-950, L 01-283, L 01-299, L 03-371, HoCP 04-838, Ho 05-961, Ho 07-613, HoCP 09-804 and L 11-183. 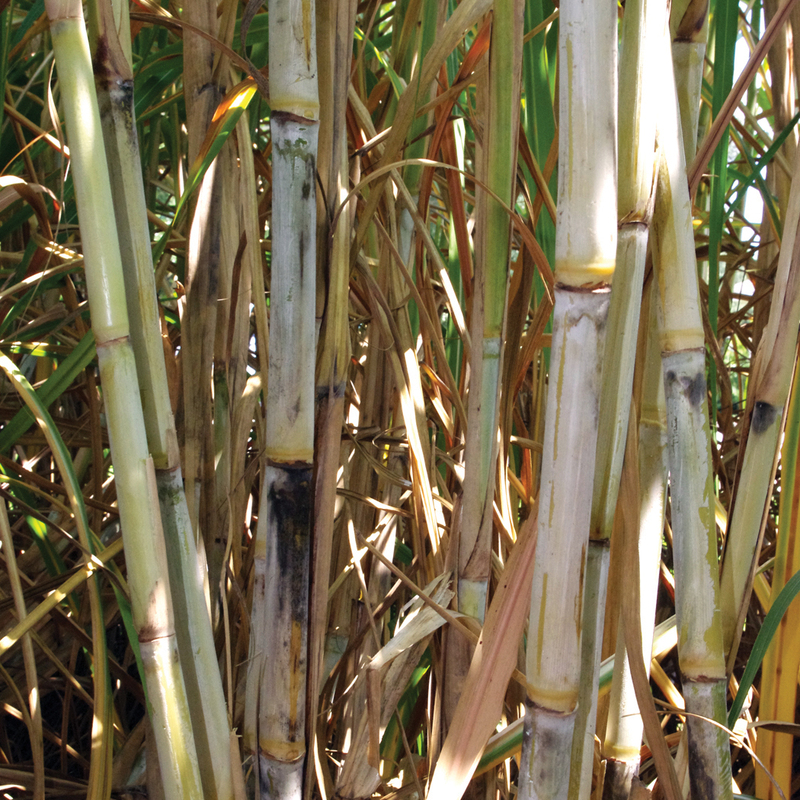 This publication will help growers identify certain botanical characteristics of the sugarcane plant that are useful in identifying sugarcane varieties. 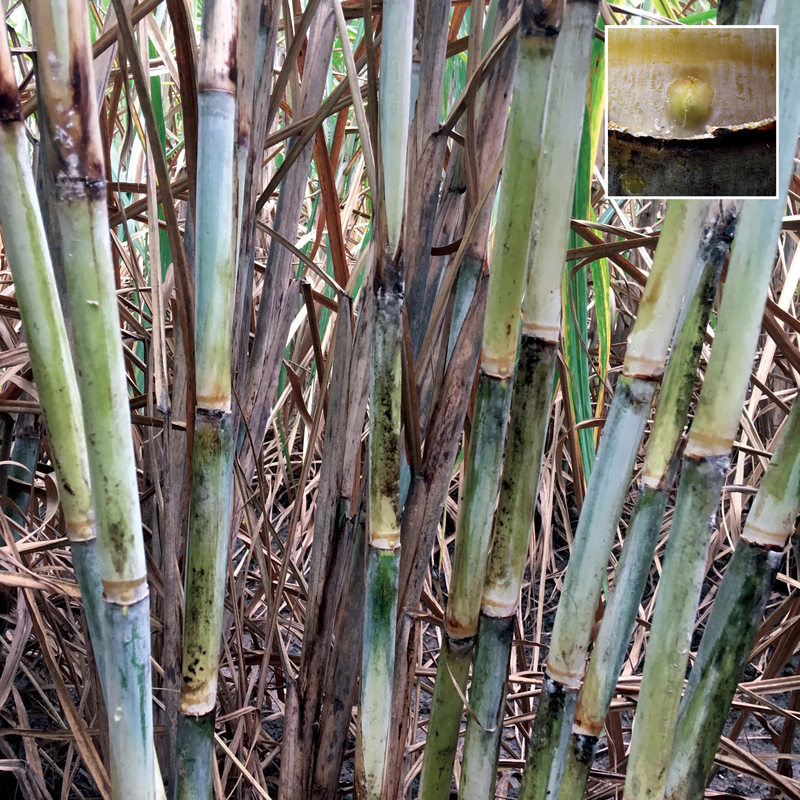 This publication outlines general vegetative characteristics of the sugarcane plant with pictures describing the differences between each of the varieties. 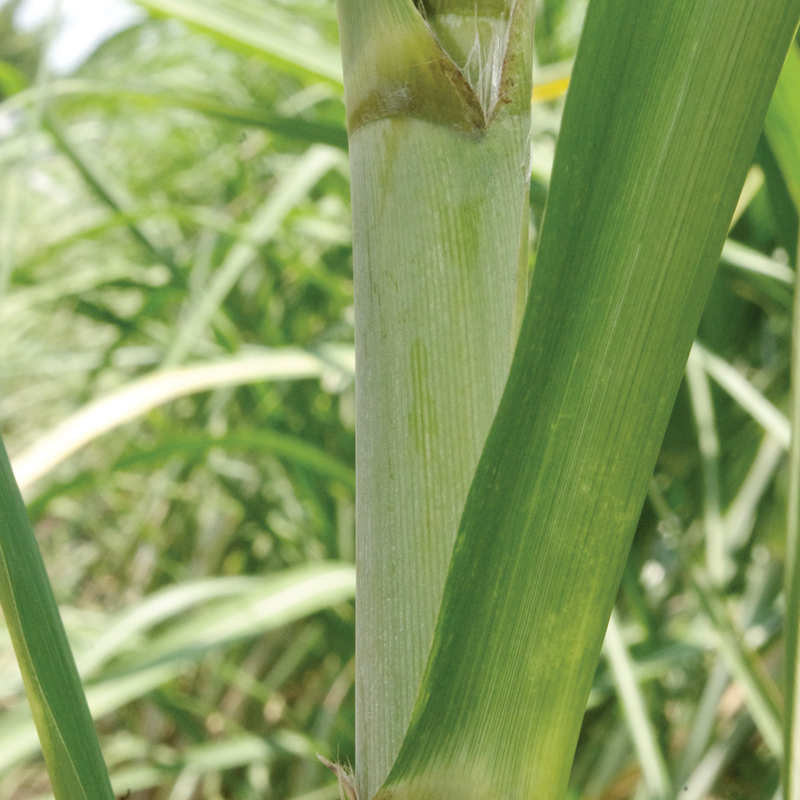 These characteristics include stalk wax, leaf sheath wax, leaf sheath margin, leaf sheath hair, dewlap, stalk color, auricle and other distinguishing characteristics. 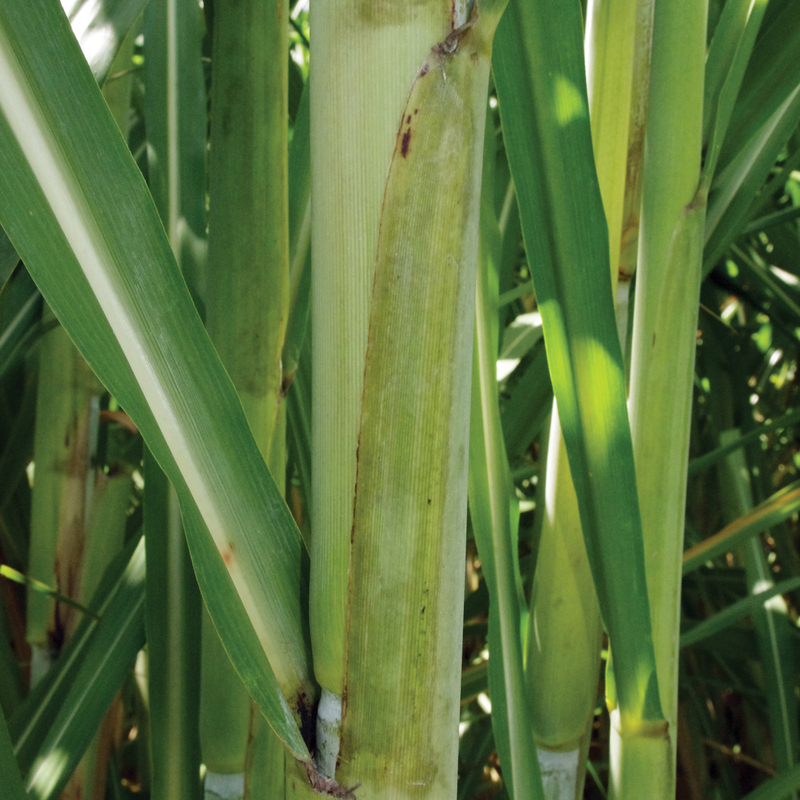 The variety descriptors used in this pictorial identification guide were established as an aid to anyone interested in identifying the commercial sugarcane varieties of Louisiana. 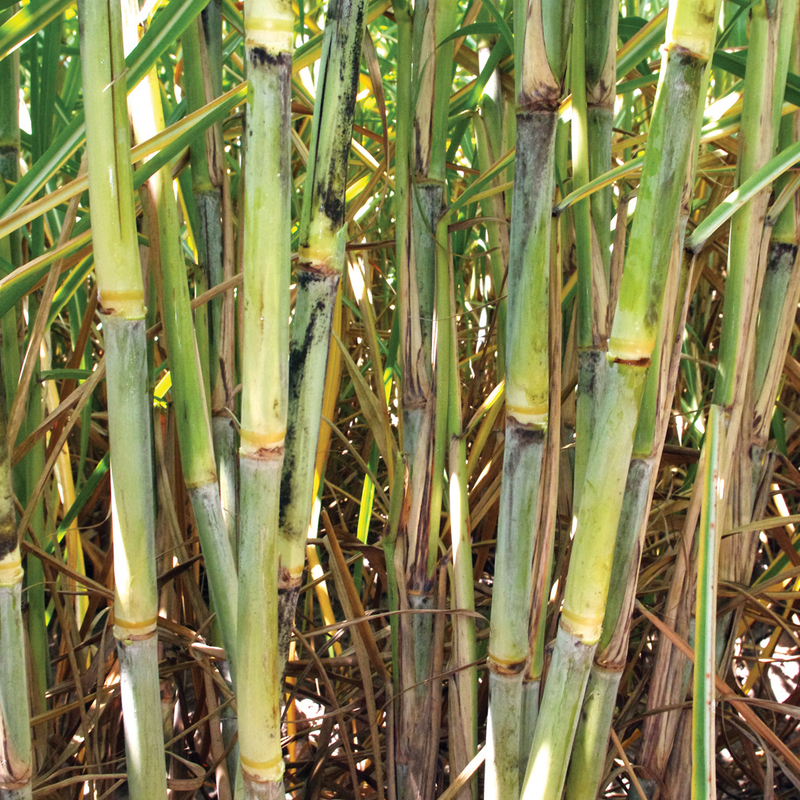 With several commercial sugarcane varieties planted by the sugarcane industry, this pictorial guide is a must for the sugarcane grower to keep track of varieties for good farming records. After briefly studying the guide and practicing the identification of the descriptors, growers should be able to identify every variety more easily. 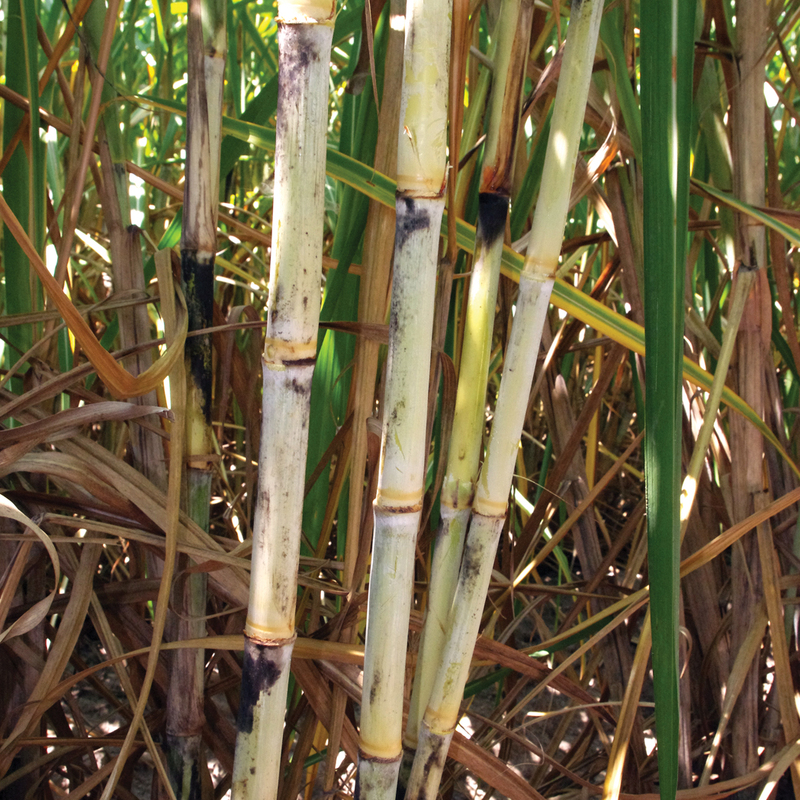 Many different sugarcane botanical descriptors could have been used in this guide, but the complexity of some can be very confusing. The variety descriptors used in this guide are the simplest and easiest of all of the descriptors available for identification. 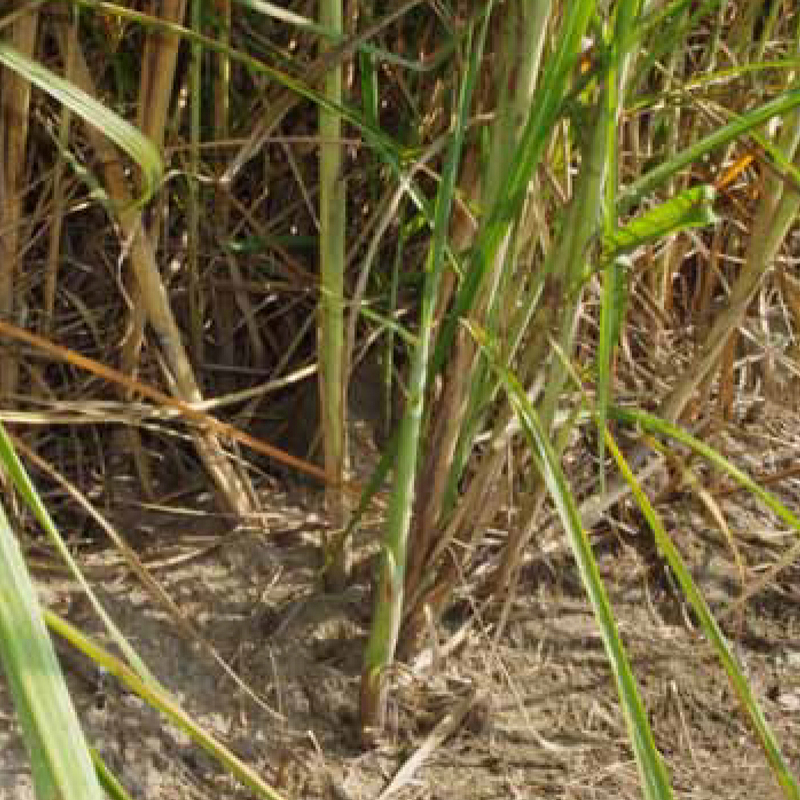 Many of the descriptors — along with the brief variety synopsis at the top of the page for each variety — have been described in some form in the sugarcane variety registration (published in Crop Science or The Journal of Plant Registrations), notice of variety release publication (Sugar Bulletin) or Sugarcane Production Handbook. 1. 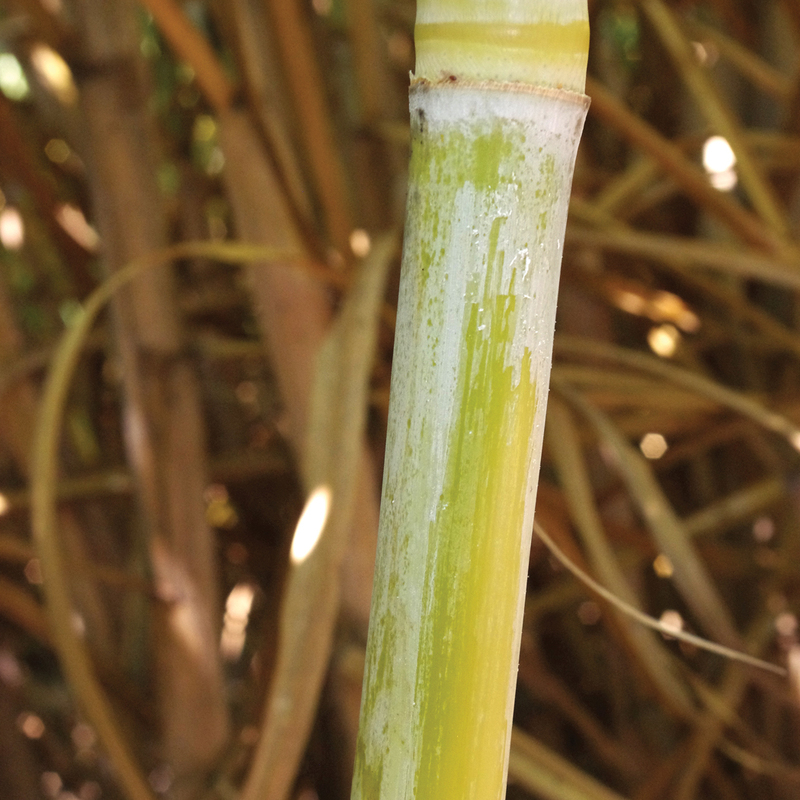 Stalk wax — Because all varieties contain stalk wax, the ratings based on this category are light (stalk color highly visible), moderate (stalk color somewhat visible) and extensive (stalk color not visible). 2. 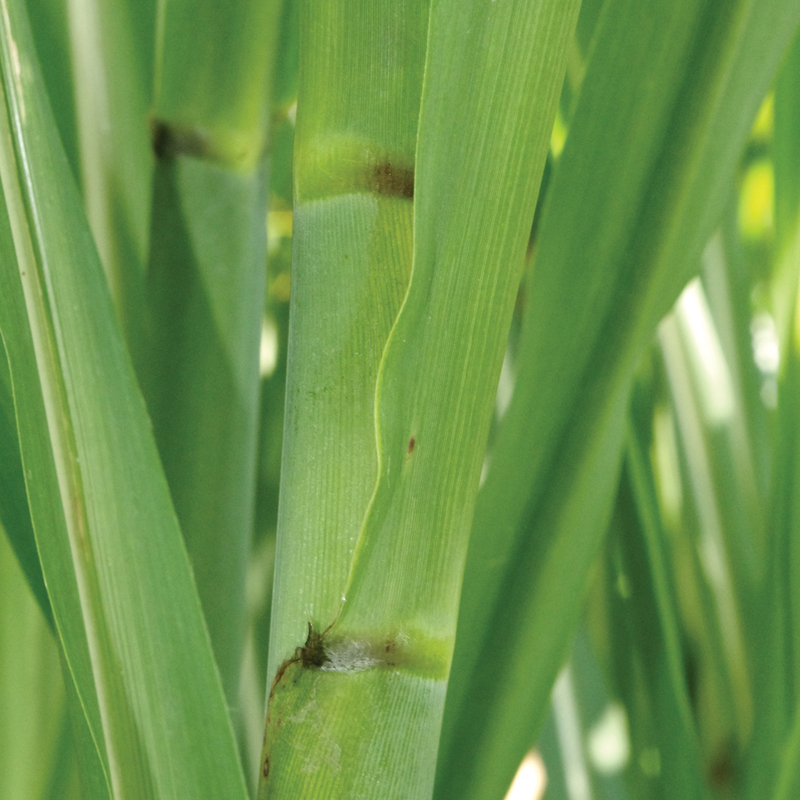 Leaf sheath wax — The ratings used to describe the leaf sheath wax are none (no wax visible), light (slight wax visible) and extensive (prominent wax visible). 3. 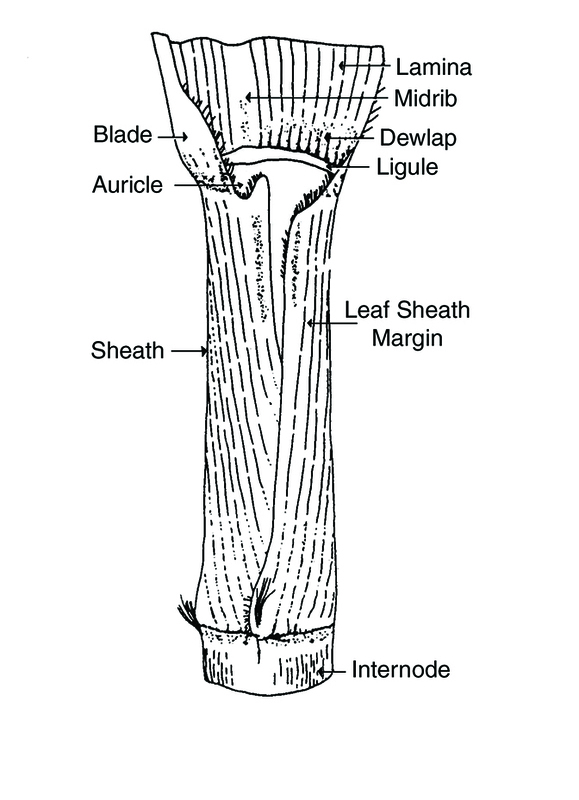 Leaf sheath margin — The outer edge of the leaf sheath where it wraps around the stalk. 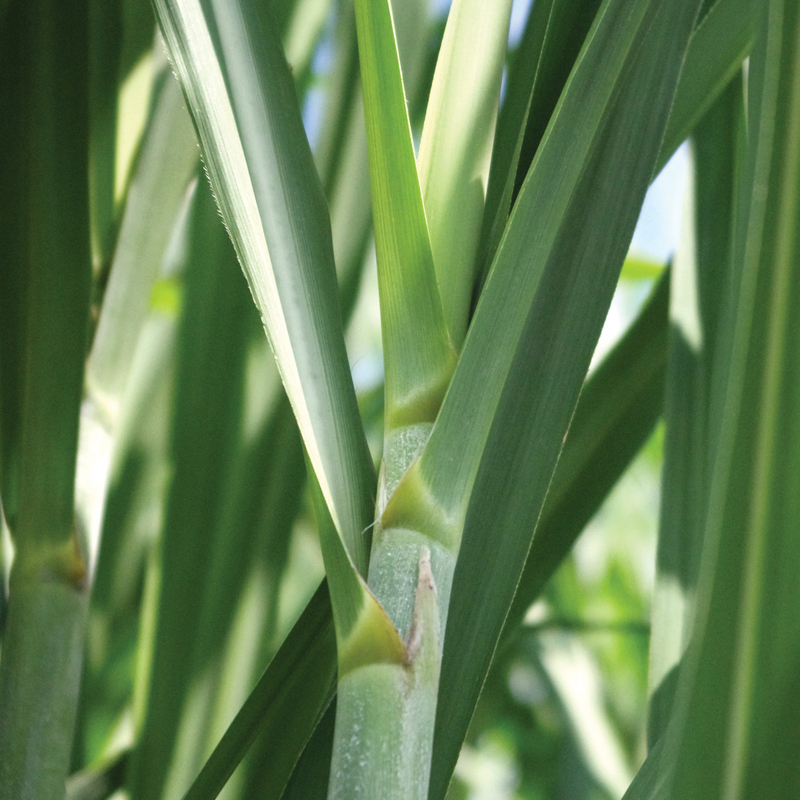 The leaf sheath margin descriptors are thin or wide along with a color description. 4. Leaf sheath hair (pubescence) — The ratings are based on hair quantity and visibility and consist of none (no hair), light (hair that can be felt but not seen), moderate (hair that can be seen but is not in large quantity) and extensive (hair that can be seen and is in large quantity). 5. 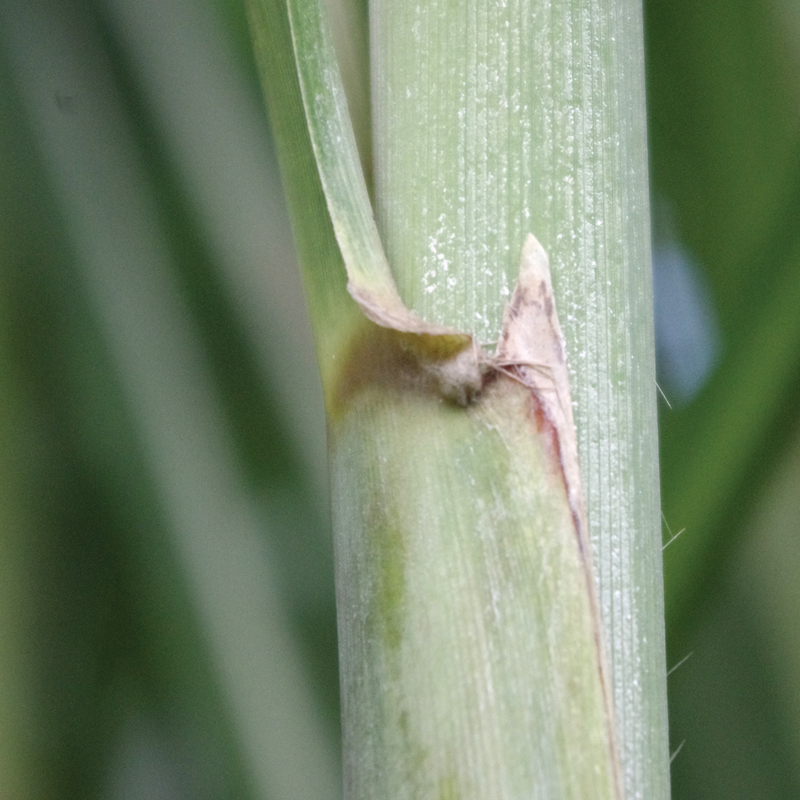 Dewlap — The hinge of the leaf blade joint where the leaf blade and the leaf sheath meet. The dewlap also will be described by color shading. The ratings will be the same (same color as leaf), darker (darker color than leaf) and lighter (lighter color than leaf). 6. 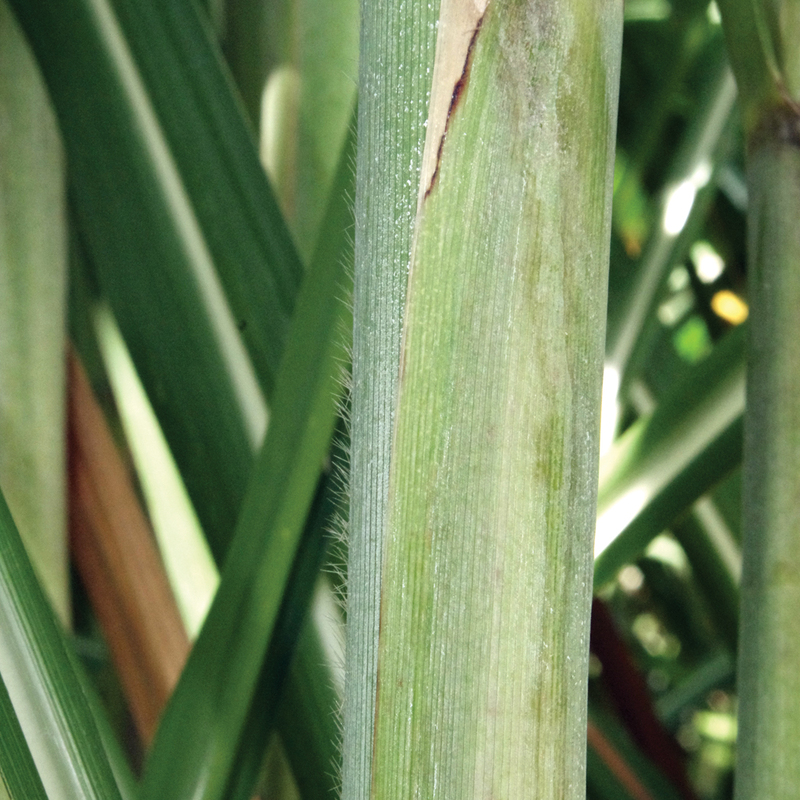 Stalk color — The stalk color represents internodes from stalks freshly cut (leaves and wax that have just been removed from the internode) because the sun and wax can have an impact on stalk color. Some varieties that express a red or purple color do so because of the exposure of the stalk to the sun. 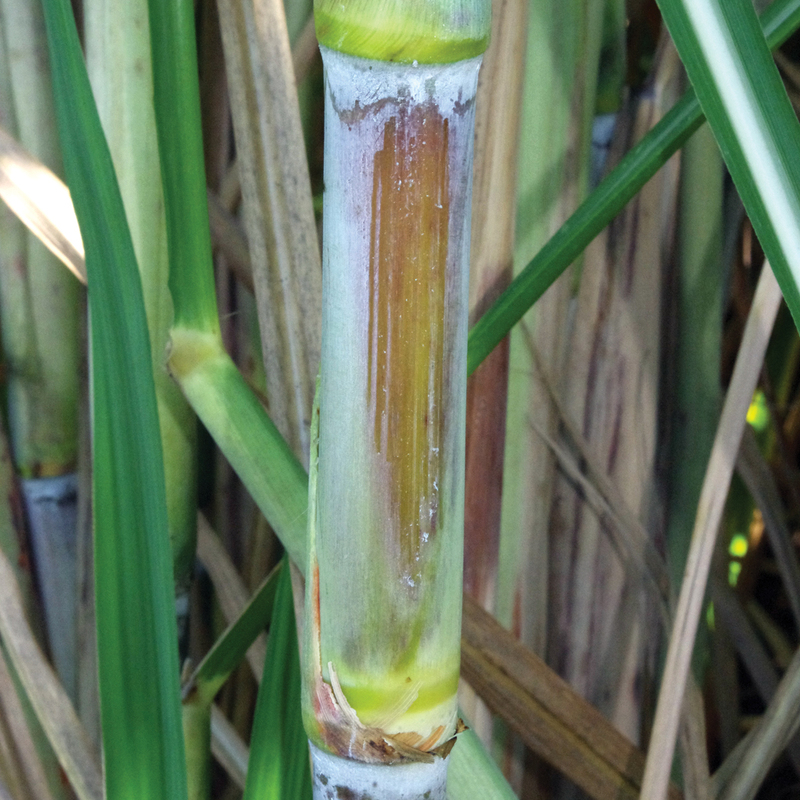 The stalk color may not be the same exact color as the template, but these base colors are a guide for identification. 7. 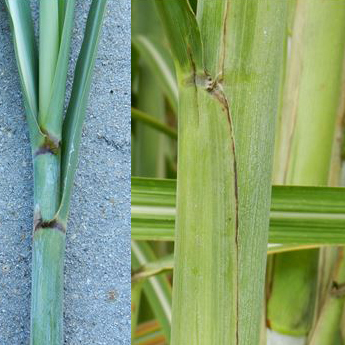 Auricle — The appendages of the leaf sheath located on the opposite side of the ligule. The auricle alternates sides from bottom of the stalk to the top of the stalk. The descriptors for the auricle are short-pointed, medium-pointed, long-pointed, shortrounded, medium-rounded, long-rounded or a tuft of hairs. 8. Distinguishing characteristic — A certain characteristic or group of characteristics that can easily be used to identify the variety. The distinguishing characteristic may or may not be one of the identification descriptors listed above. HoCP 96-540 was derived from a cross made between LCP 86-454 as the female parent and LCP 85-384 as the male parent. 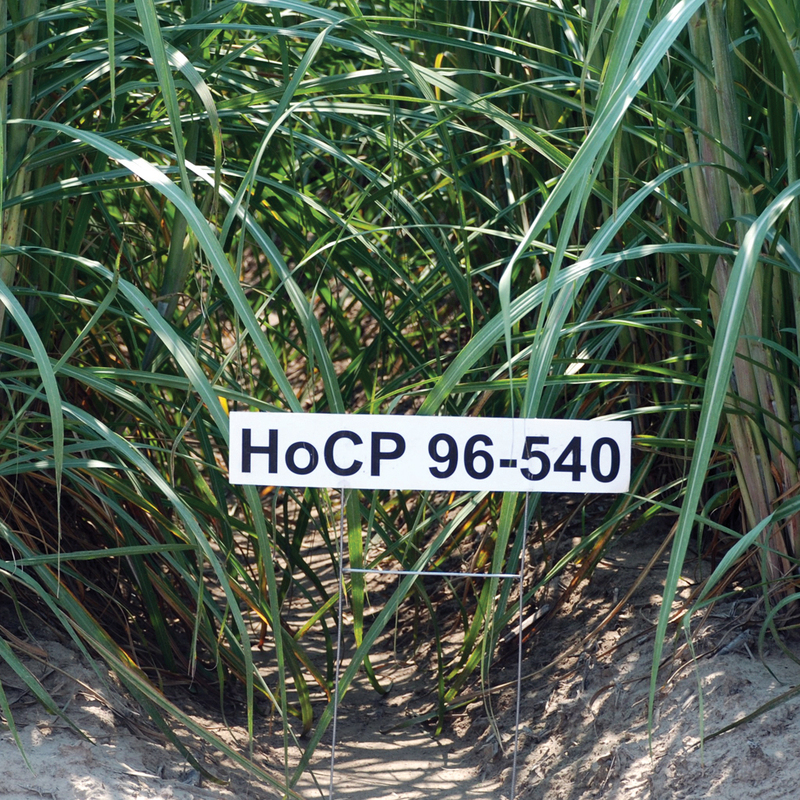 HoCP 96-540 is a variety that has a moderate population of medium-sized stalks with good stubbling ability. 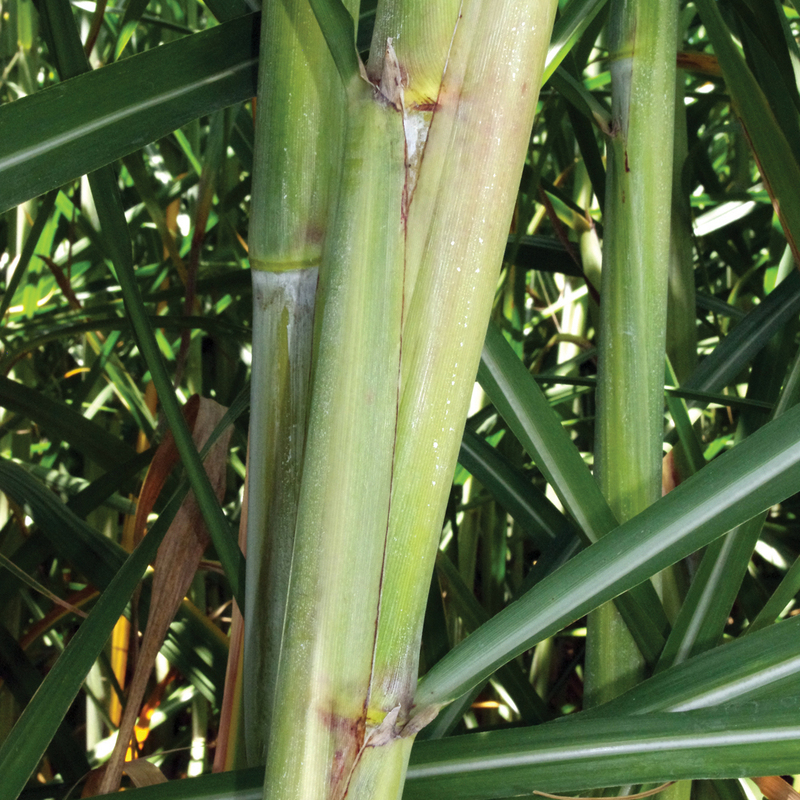 HoCP 96-540 is a mid-maturing variety with excellent stalk density that provides for superior sugar and cane yields (Tew et al., 2005). The following pictures will show eight different characteristics to help in identifying HoCP 96-540. 1. Canopy – Moderately erect with leaf tips making a right angle at the top. 2. 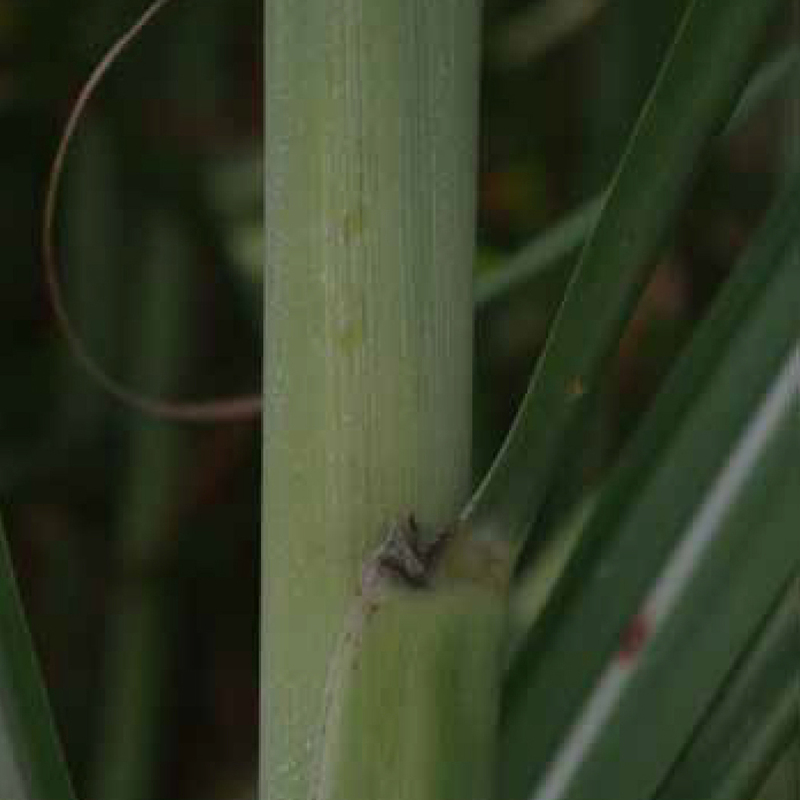 Stalk wax – Slight to moderate. 3. 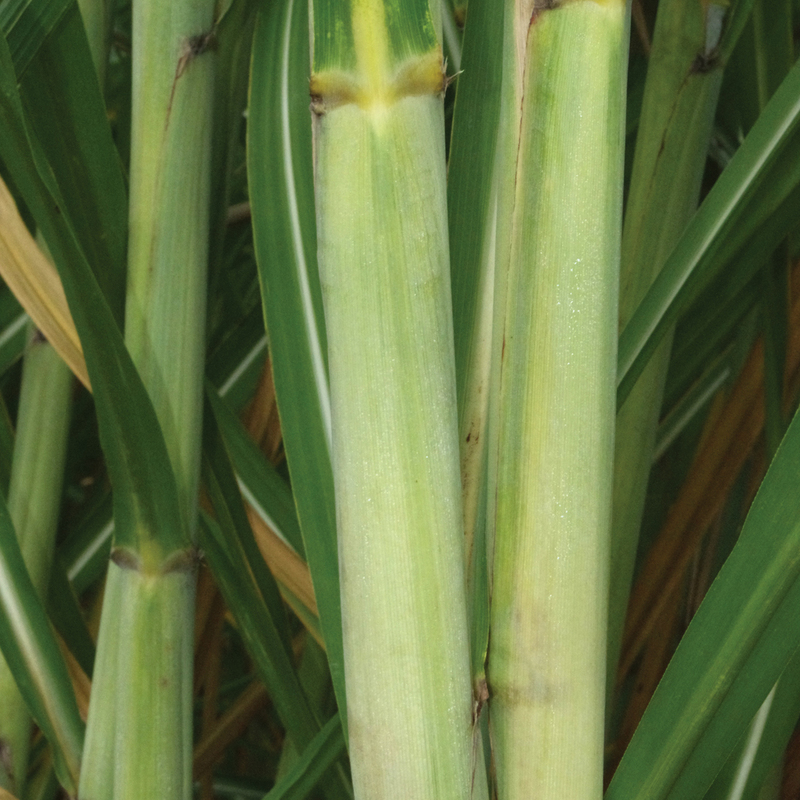 Stalk color under the wax layer – Green stalks with a yellow color under the leaf sheath. 4. Leaf heath – Heavy wax layer with no pubescence (hair); with prolonged exposure to the sun the leaf sheaths become reddish pink in color. 5. Leaf sheath margin – Non-necrotic with purple edges on occasion. 6. Dewlap – Light olive green. 7. Auricle – Slight to moderate in length. 8. Distinguishing characteristics – The heavy wax layer and non-necrotic leaf margin help distinguish this variety from HoCP 04-838. L 99-226 was derived from a cross made between HoCP 89-846 as the female parent and LCP 81-30 as the male parent. 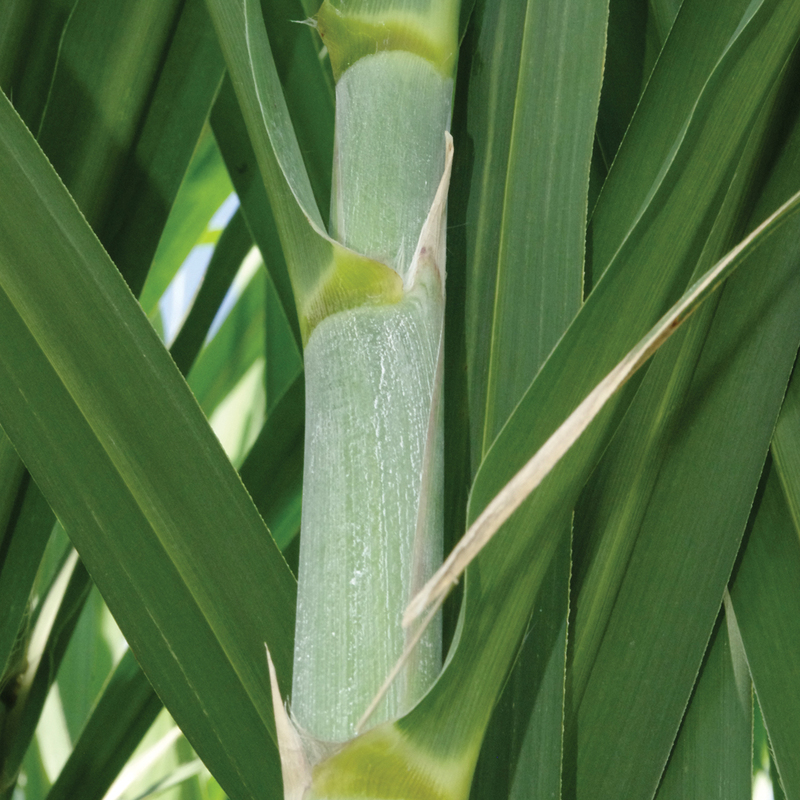 L 99-226 is a variety that has an average population of large-diameter stalks with very good stubbling ability. L 99-226 is a mid-maturing variety with sugar levels that increase throughout harvest (Bischoff et al., 2009). The following pictures will show eight different characteristics to help in identifying L 99-226. 1. Canopy – Drooping and spreading. 2. 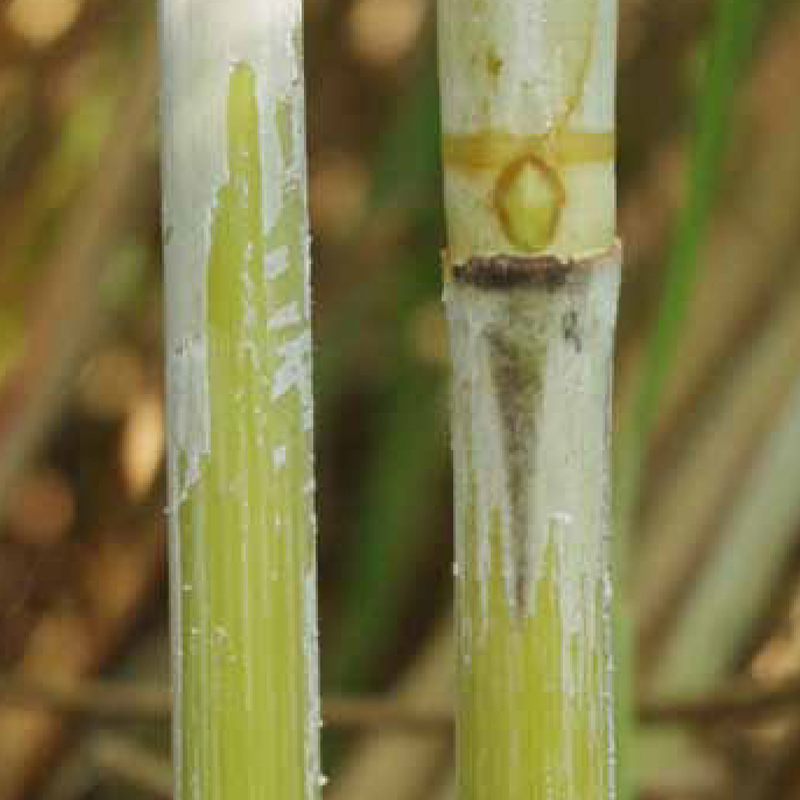 Stalk wax – Moderate wax layer. 3. 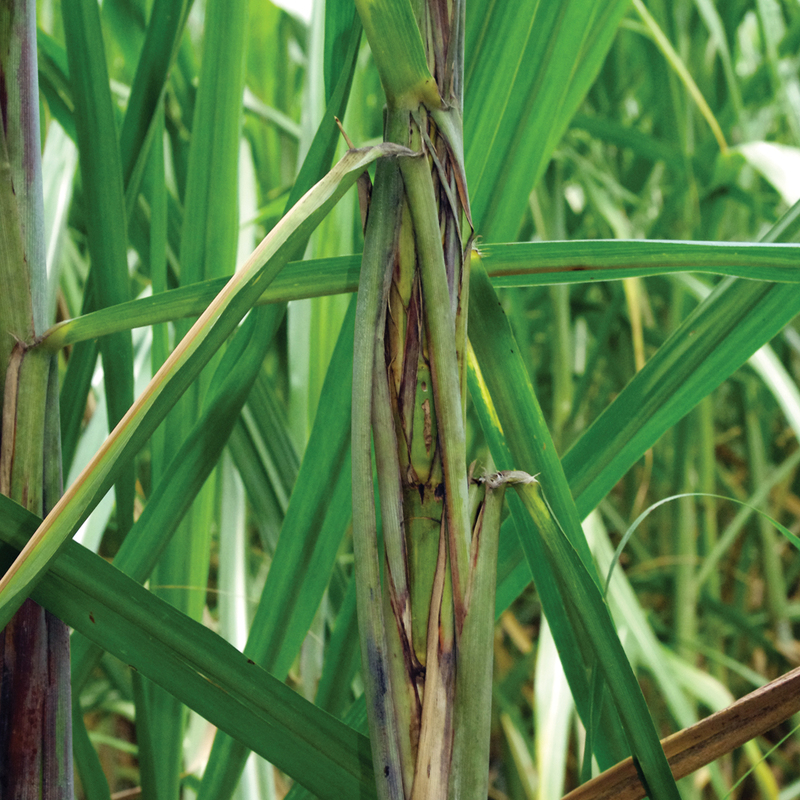 Stalk color under wax layer – Dark green with purplish hues that deepen with sun exposure; with direct exposure, the stalk becomes deep purple. 4. 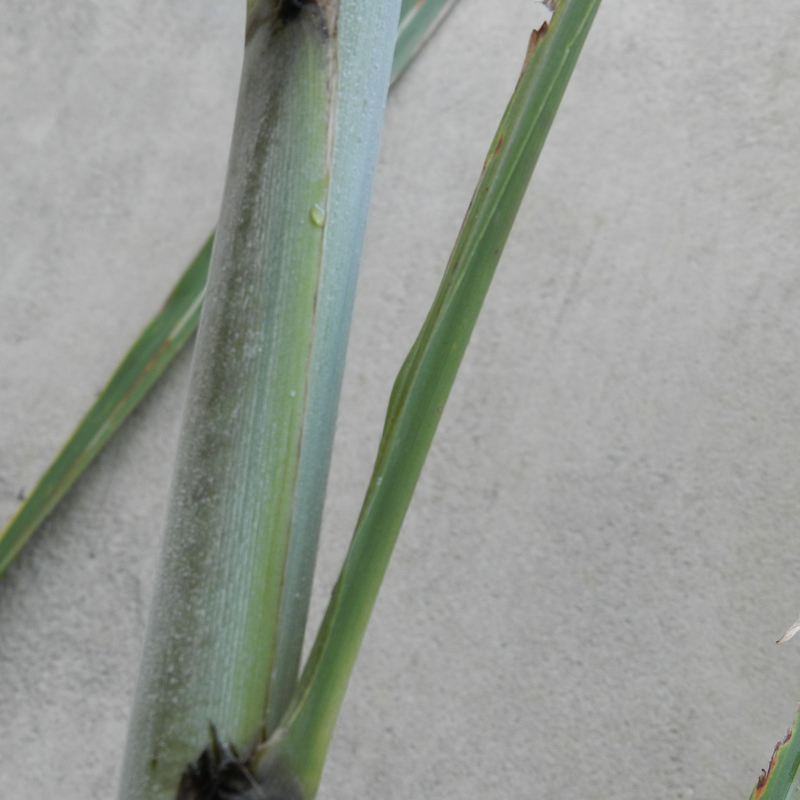 Leaf sheath – Very little wax and no pubescence (hair). 5. 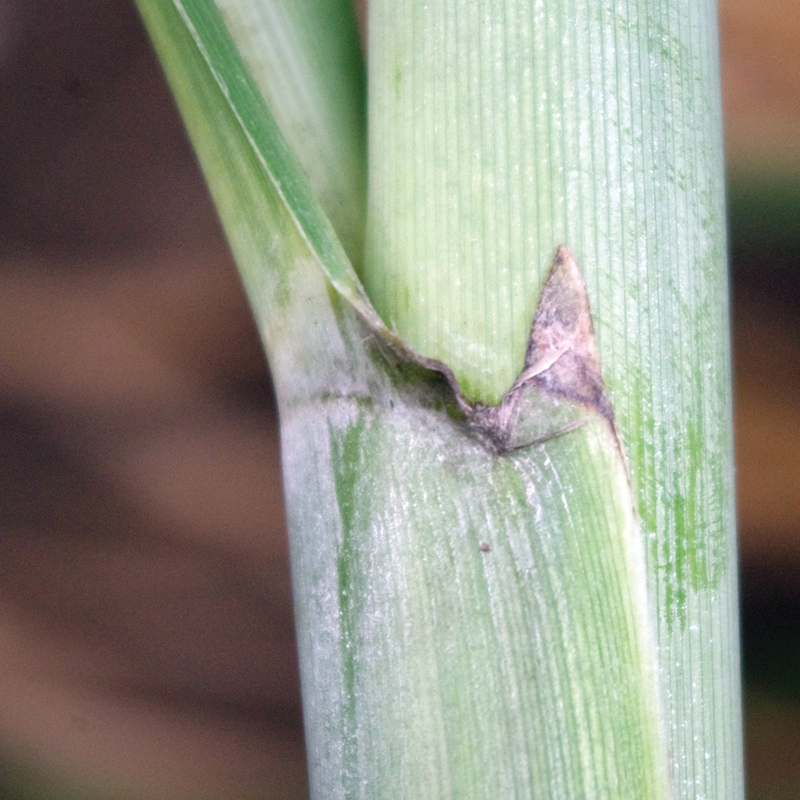 Leaf sheath margin – Very necrotic leaf sheath margin edges that extend into a long auricle. 6. Dewlap – Light green with light-brown segment at each edge. 7. Auricle – Long, necrotic and prominent. 8. 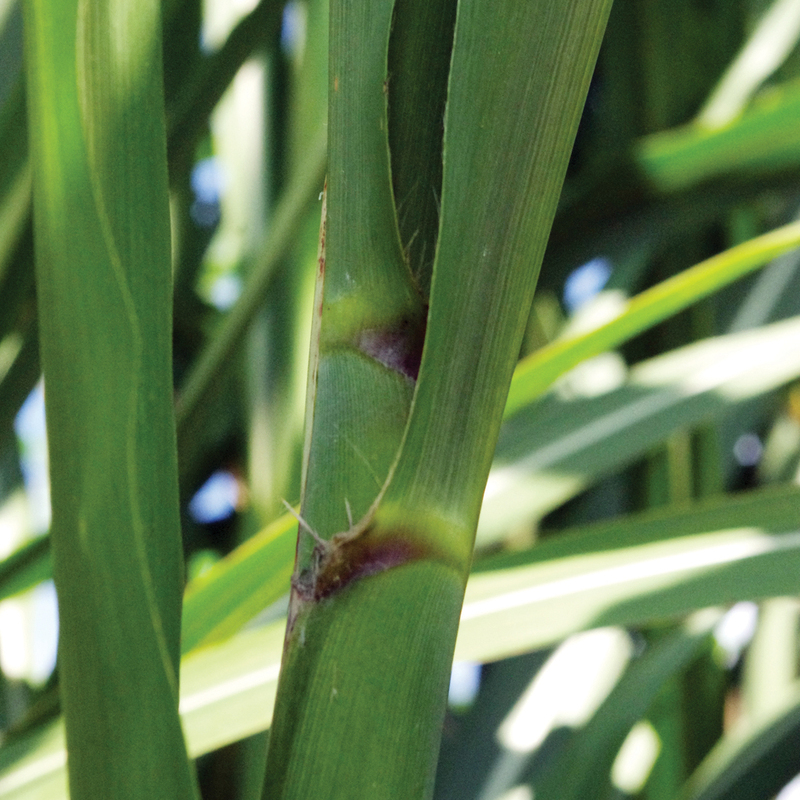 Distinguishing characteristics – Deep purple internodes when exposed to the sun; leaf blade is pubescent. HoCP 00-950 was derived from a cross made between HoCP 93-750 as the female parent and HoCP 92-676 as the male parent. 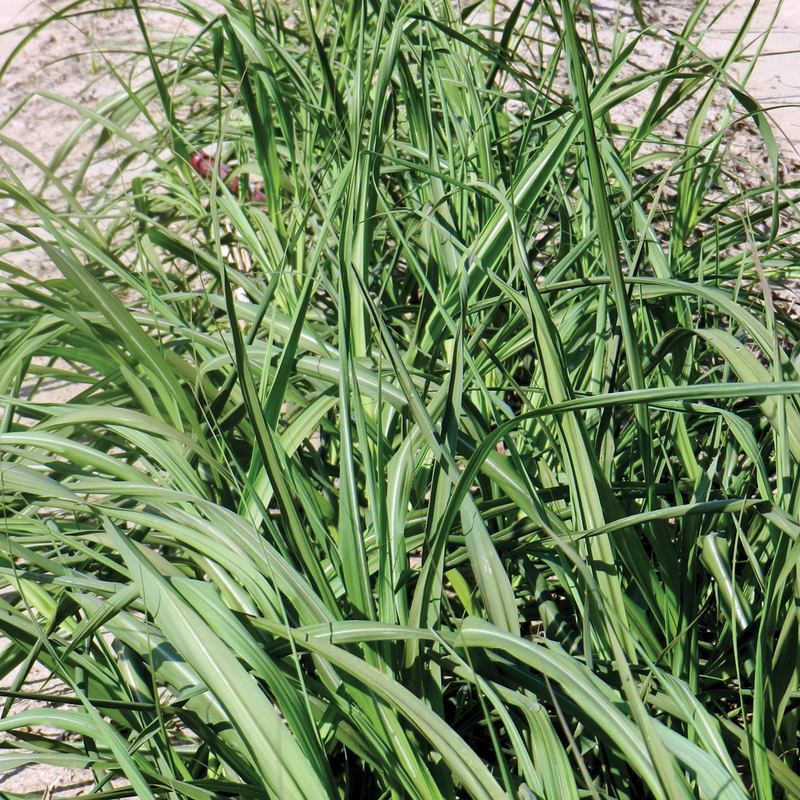 HoCP 00-950 is a variety that has a high population of medium-sized stalks with good stubbling ability. 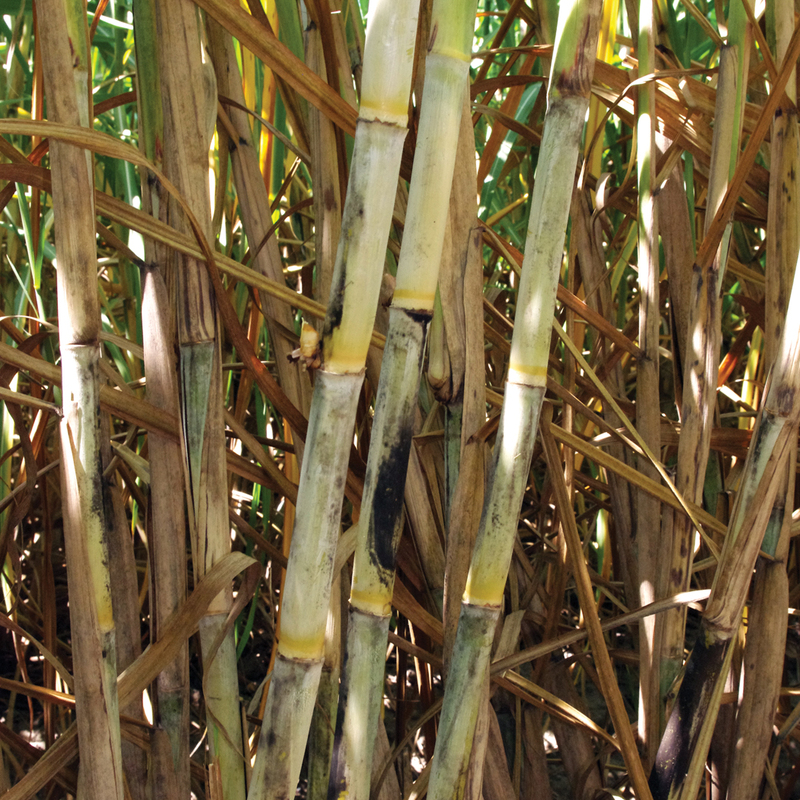 HoCP 00-950 is an early-maturing variety that continues to accumulate sugar throughout the normal harvest season (Tew et al., 2007). The following pictures will show eight different characteristics to help in identifying HoCP 00-950. 1. 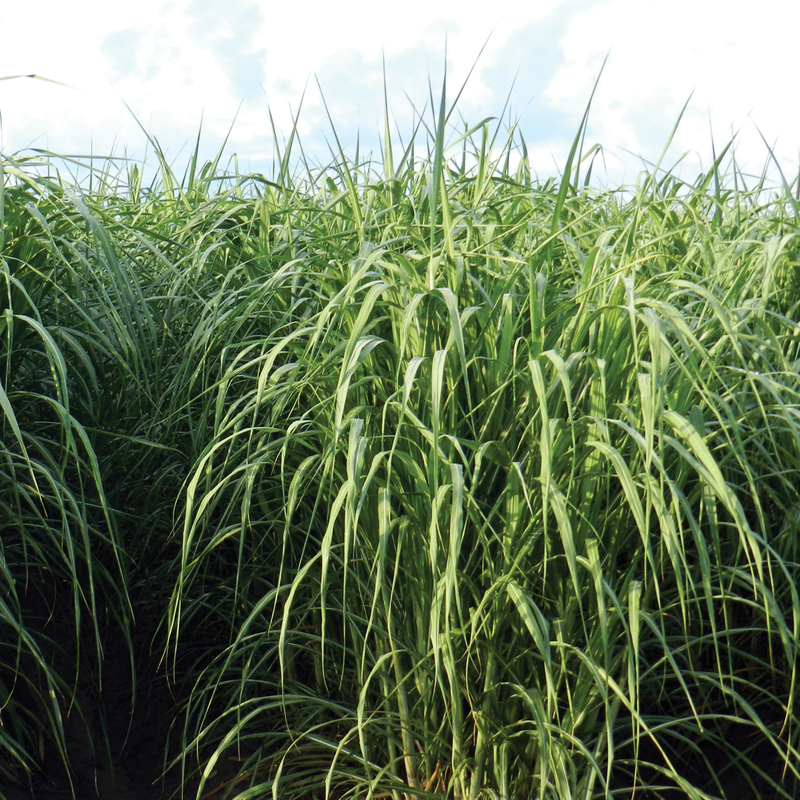 Canopy – Drooping and spreading with distinct curling of leaf blades that mimics drought stress. 2. 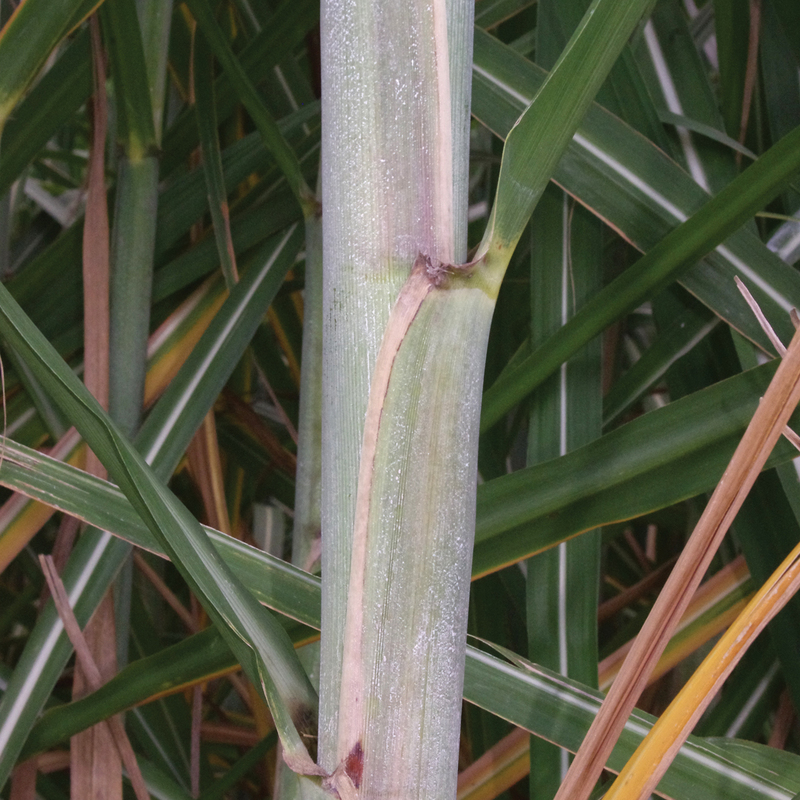 Stalk appearance – Heavy wax layer. 3. 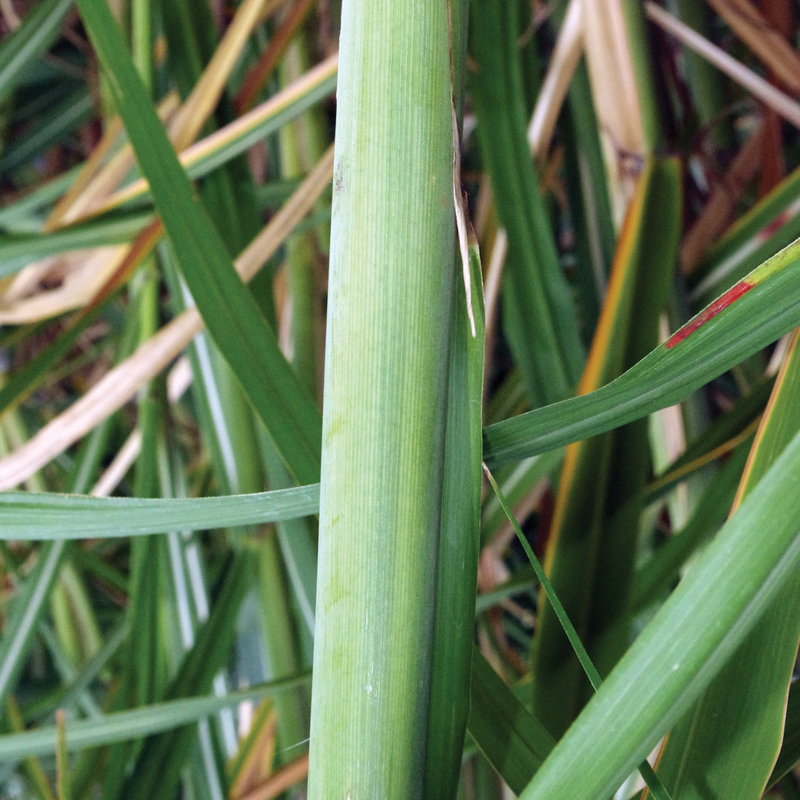 Stalk Color under the wax layer – green with slight bronzing on the older exposed stalk. 4. Leaf sheath – No pubescence.s. 5. Leaf sheath margin – Green; some with thin purple margins. 7. Auricle – Ranges from none to medium in length (usually green compared to necrotic in L 99-226). 8. 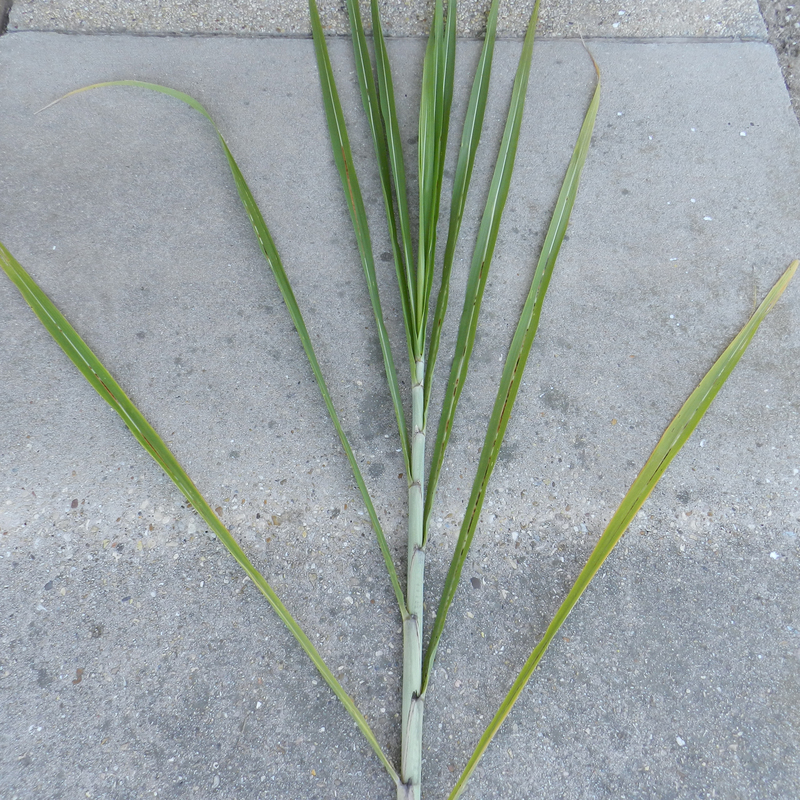 Distinguishing characteristics – Curled leaf blade in early growth; smooth leaf blade when rubbing fingers on blade from tip toward the stalk; internodes have zig-zag pattern; barrel-shaped with constricted root bands. L 01-283 was derived from the cross made between L 93-365 as the female parent and LCP 85-384 as the male parent (Gravois et al., 2010). The variety was released in 2008. 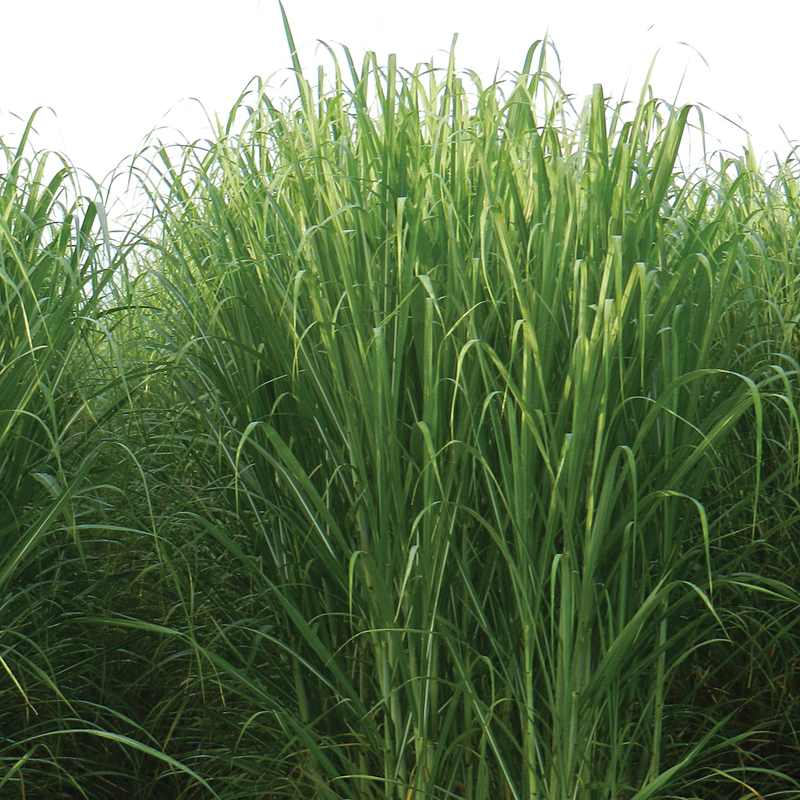 L 01-283 is a variety that has a high population of medium-sized stalks with excellent stubbling ability. 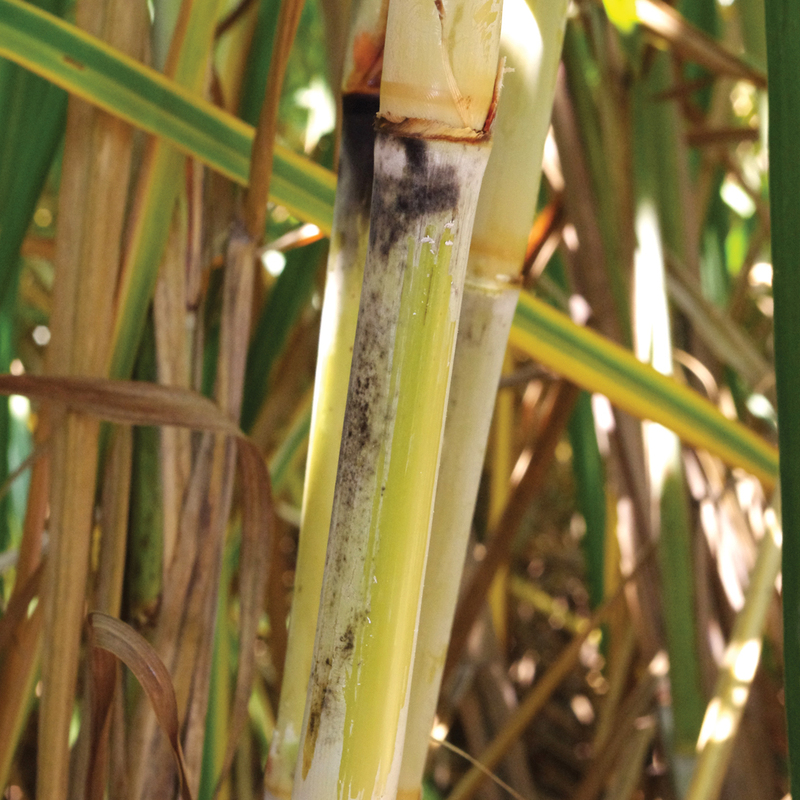 L 01-283 is an early-maturing variety that continues to accumulate sugar throughout the normal harvest season. The following pictures will show eight different characteristics to help in identifying L 01-283. 1. Canopy – Erect; slightly more erect and darker green than HoCP 96-540 and HoCP 04-838. 3. 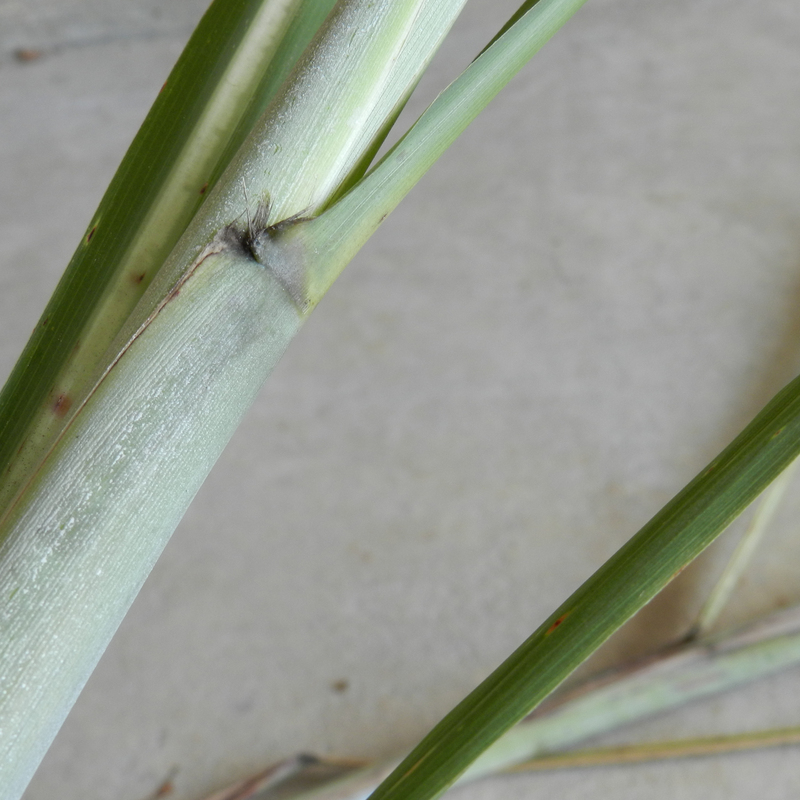 Stalk color under the wax layer – Greenish yellow; very slight bud groove. 4. Leaf sheath – No pubescence and less wax than HoCP 96-540. 5. Leaf sheath margin – Slightly necrotic leaf sheath margin. 6. Dewlap – Olive green. 7. Auricle – Slight to moderate in length when present. 8. 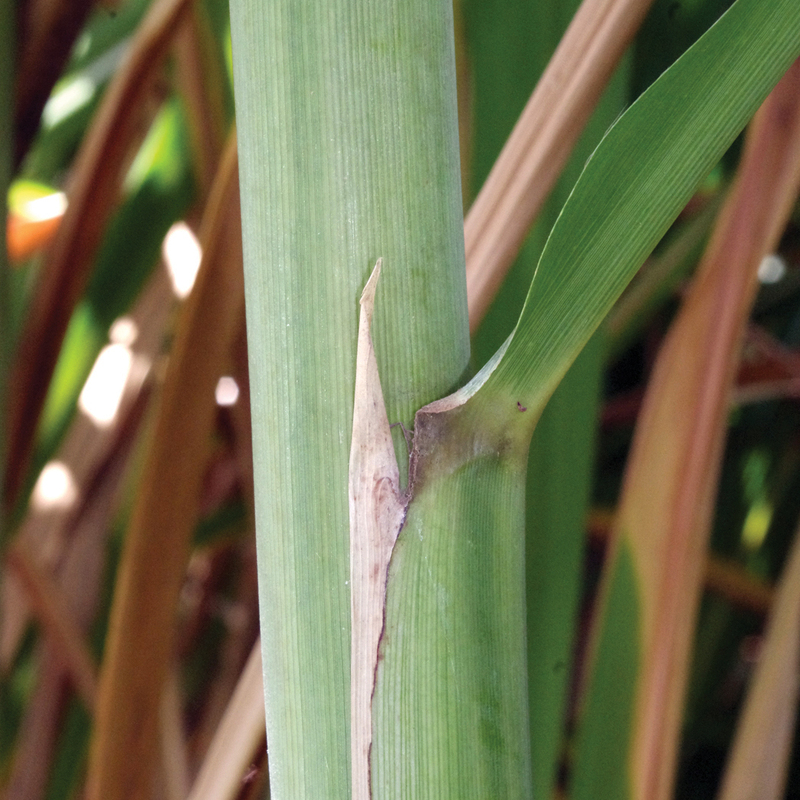 Distinguishing characteristics – Split leaf sheath that exposes a green stalk, often associated with red blotches on the leaf sheath. L 01-299 was derived from the cross made between L 93-365 as the female parent and LCP 85-384 as the male parent (Gravois et al., 2011). The variety was released in 2009. 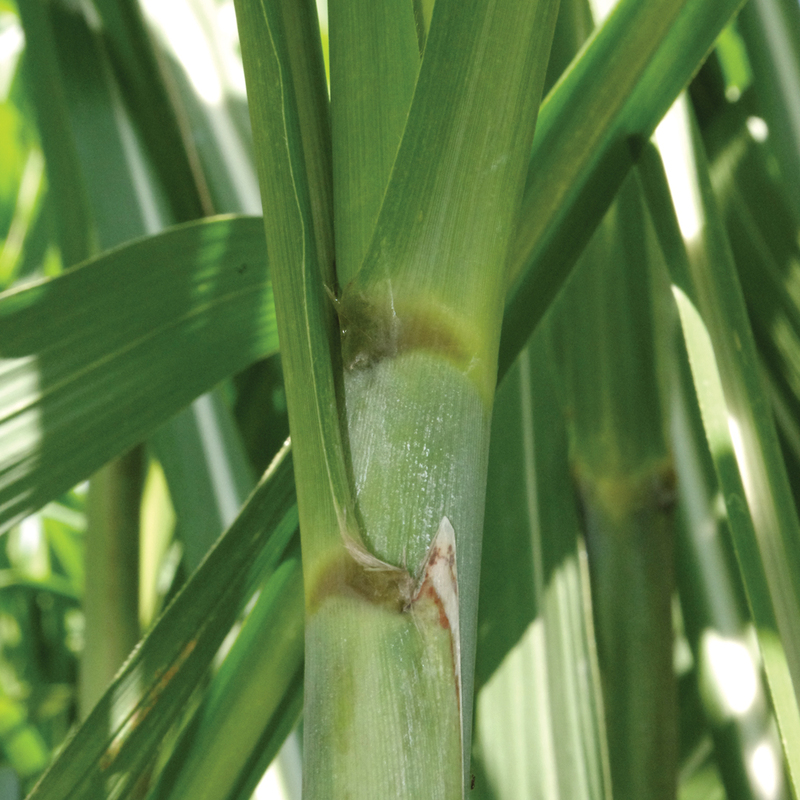 This variety has a high population of medium-sized stalks with excellent stubbling ability. 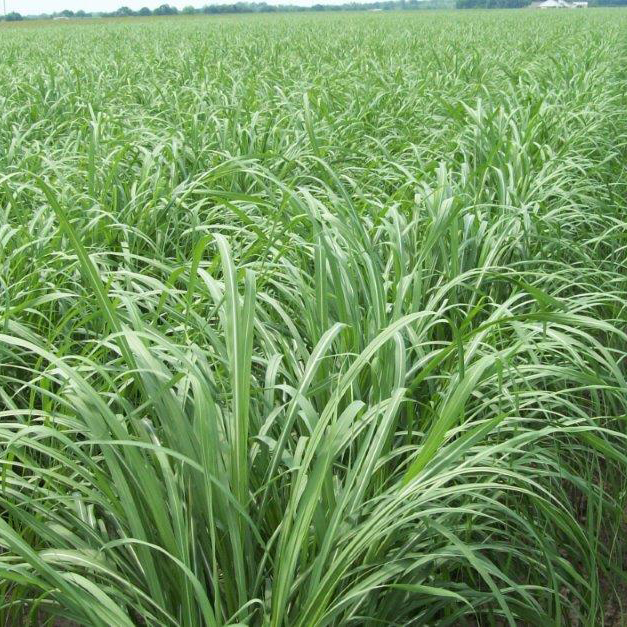 This is a midmaturing variety with excellent sugar yield potential. The following pictures will show eight different characteristics to help in identifying L 01-299. 1. Canopy – Smooth, rounded canopy. 2. 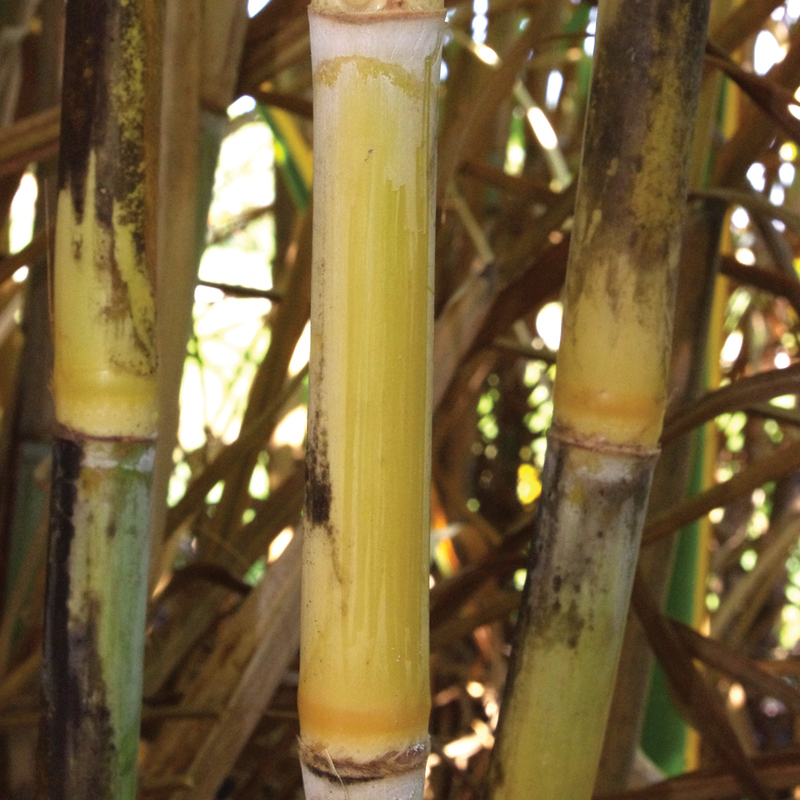 Stalk wax – Moderate wax with yellowish appearance. 3. 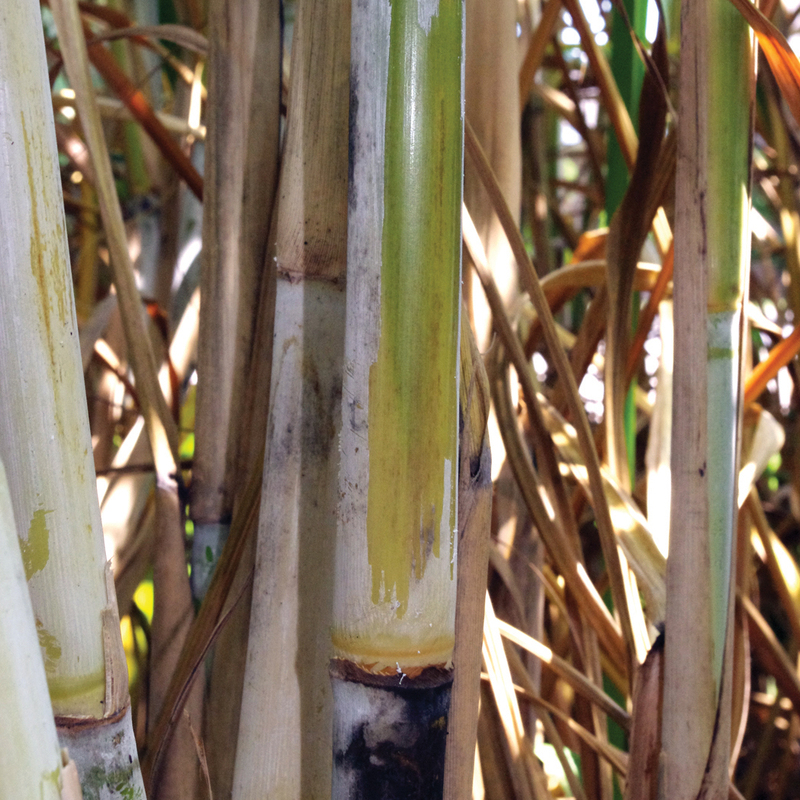 Stalk color under the wax layer – Greenish yellow that becomes more yellow with age and sun exposure. 4. Leaf sheath – No pubescence. 5. Leaf sheath margin – Green with some thin purple margin edge occasionally. 6. Dewlap – Dark olive green that becomes much darker with more mature growth in the fall. 8. 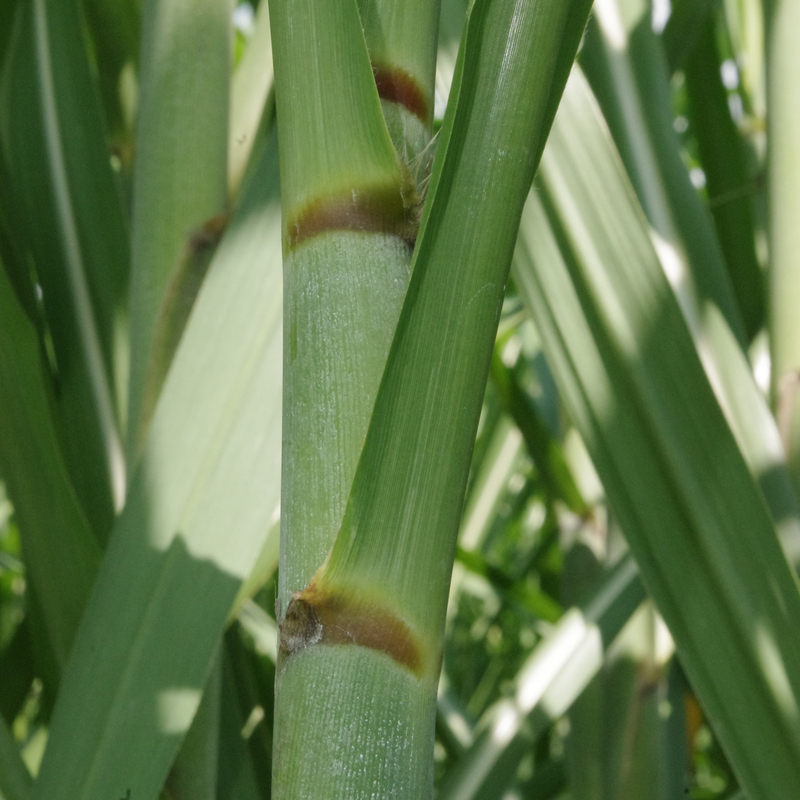 Distinguishing characteristics – Smooth, rounded canopy and dark dewlaps; stalks have growth cracks; leaves in canopy have high angle. L 03-371 was derived from the cross made between CP 83-644 as the female parent and LCP 82-89 as the male parent (Gravois et al., 2012). The variety was released in 2010. 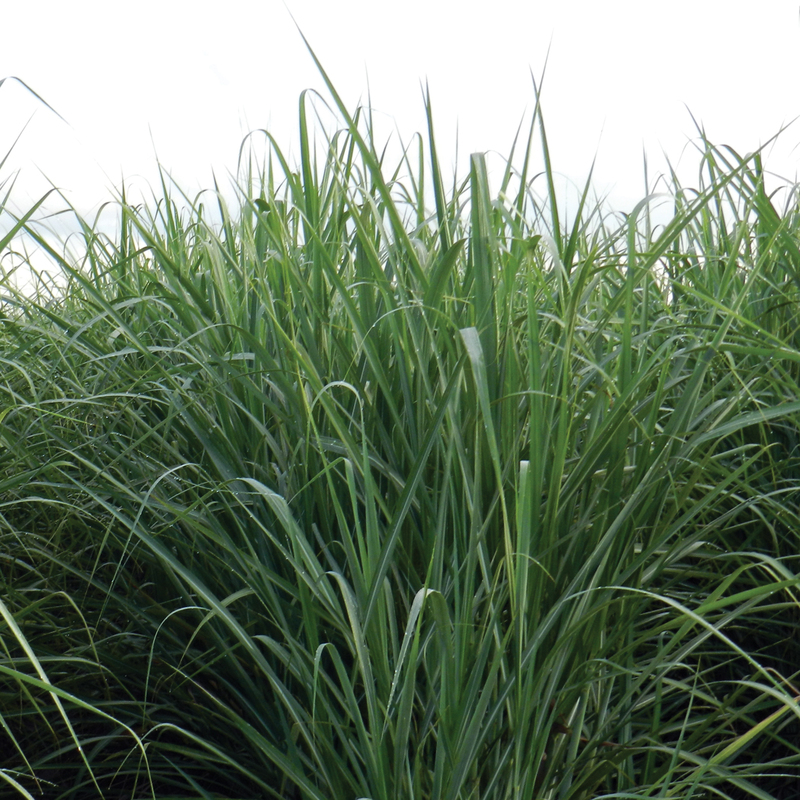 L 03-371 is a variety that has a high population of medium-sized stalks with very good stubbling ability. 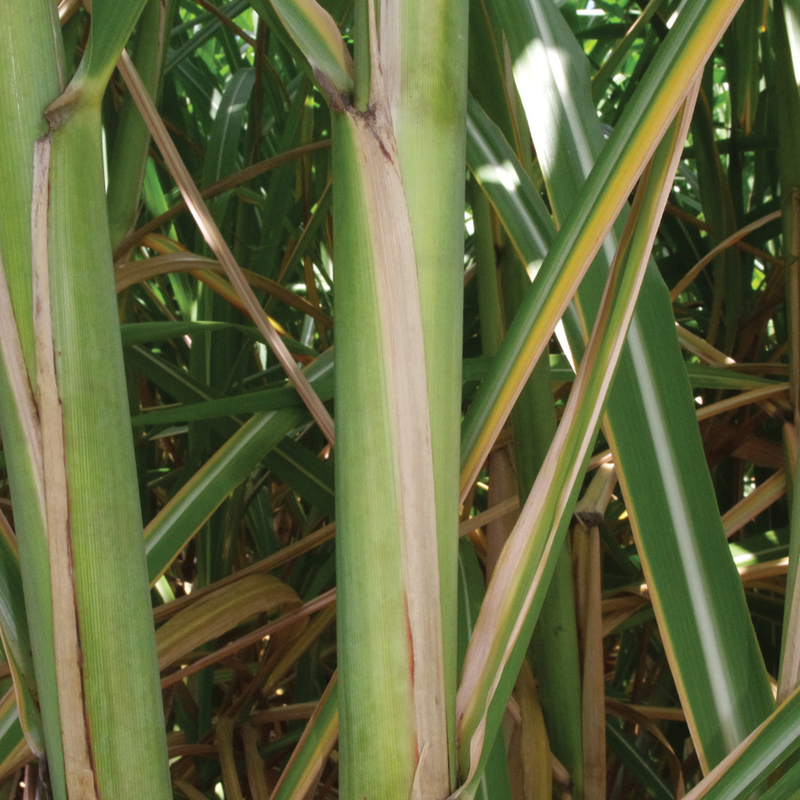 This is an early maturing variety that continues to accumulate sugar throughout the normal harvest season. The following pictures will show eight different characteristics to help in identifying L 03-371. 1. Canopy – Rounded canopy. 2. 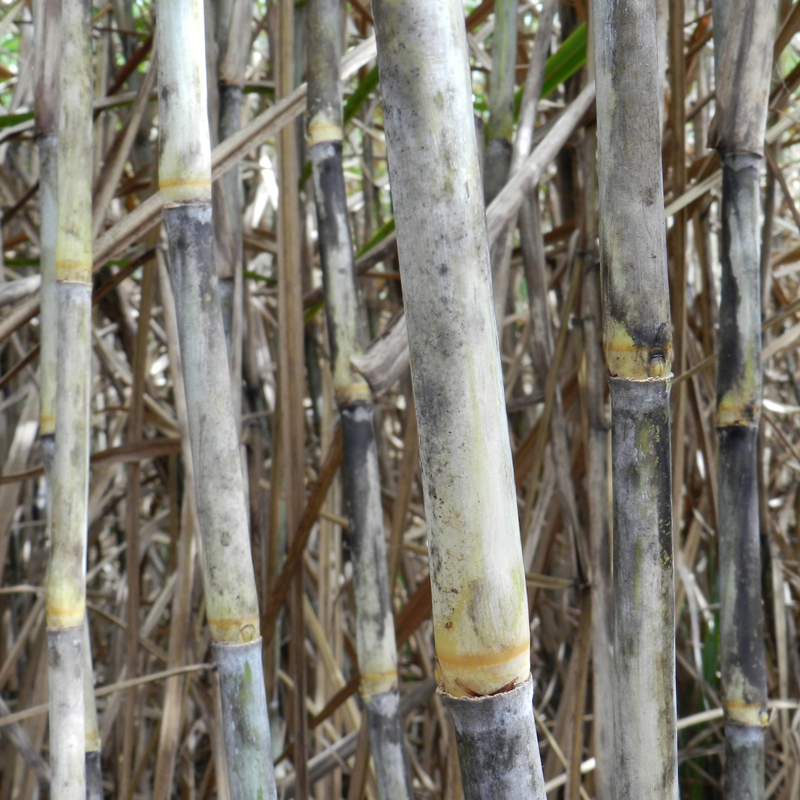 Stalk wax – Slight with overall yellowish appearance. 3. 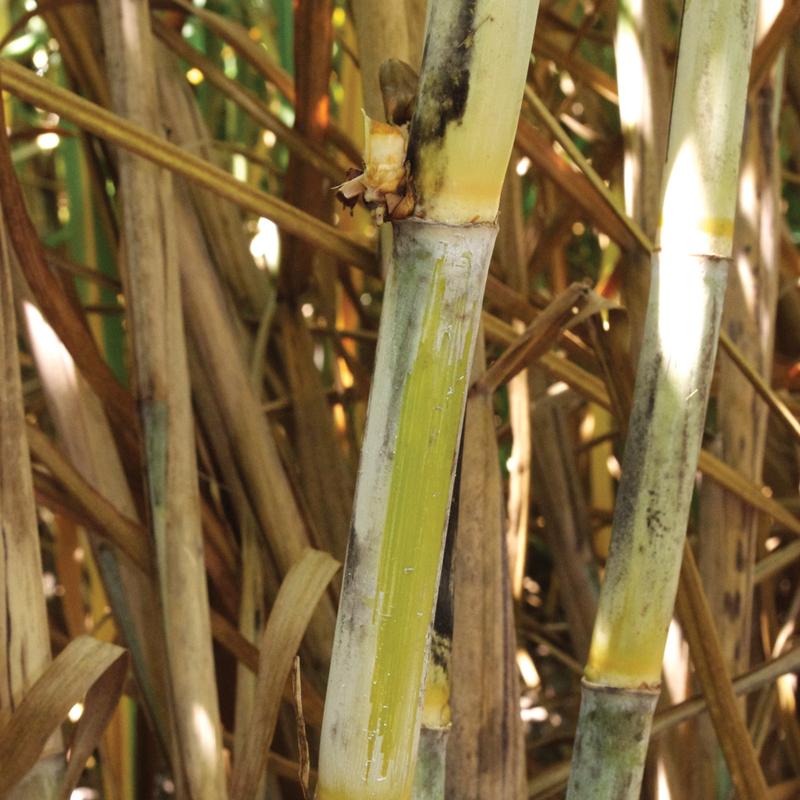 Stalk color under the wax layer – Greenish yellow that becomes more bronze with exposure to the sun. 4. 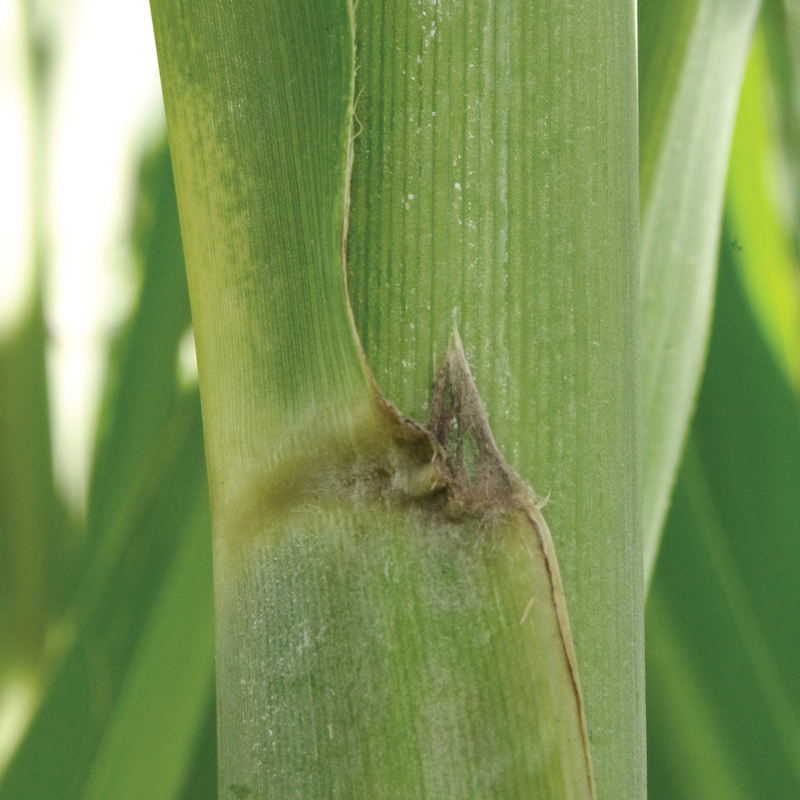 Leaf sheath – Moderate amount of pubescence (not as much as LCP 85-384). 5. Leaf sheath margin – Necrotic leaf sheath margin. 7. Auricle – Slight to moderate. 8. 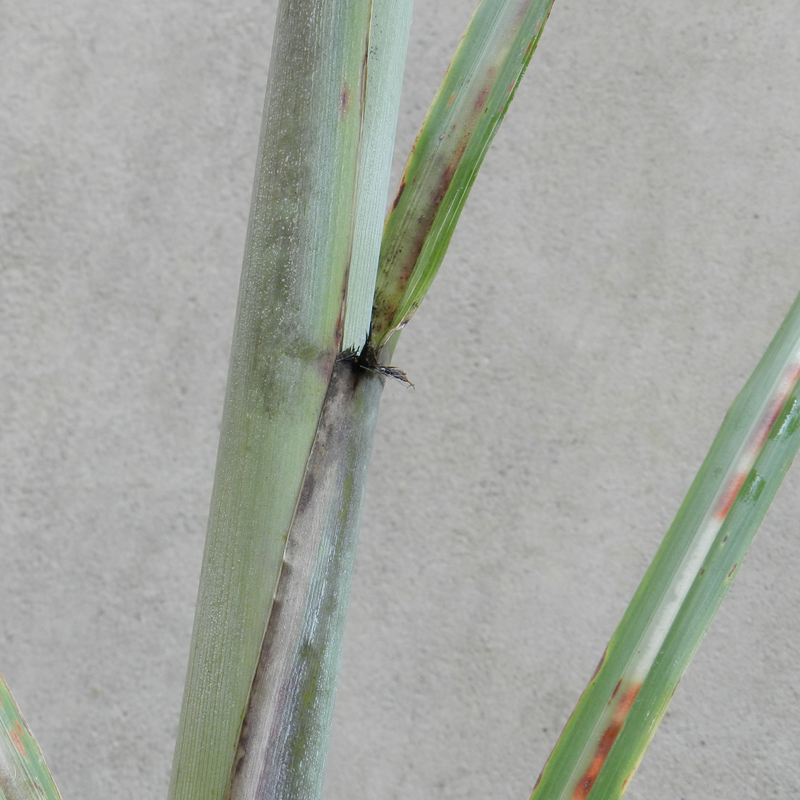 Distinguishing characteristics – Bronzed stalk color with exposure to the sun and pink-tinged leaf sheaths; moderate amount of leaf sheath pubescence. HoCP 04-838 was derived from the cross made between HoCP 85-845 as the female parent and LCP 85-384 as the male parent (Anonymous, 2011). The variety was released in 2011. HoCP 04-838 is a variety that has a high population of medium-sized stalks with good stubbling ability and very good cold tolerance. 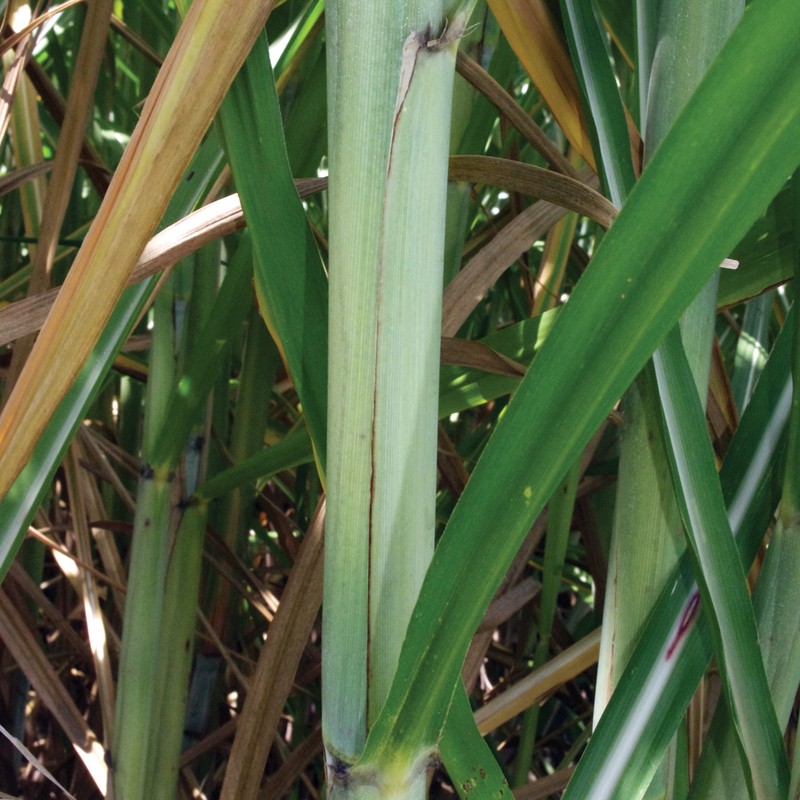 HoCP 04-838 is a midmaturing variety that continues to accumulate sugar throughout the normal harvest season. The following pictures will show eight different characteristics to help in identifying HoCP 04-838. 1. Canopy – Slightly rounded to erect. 2. 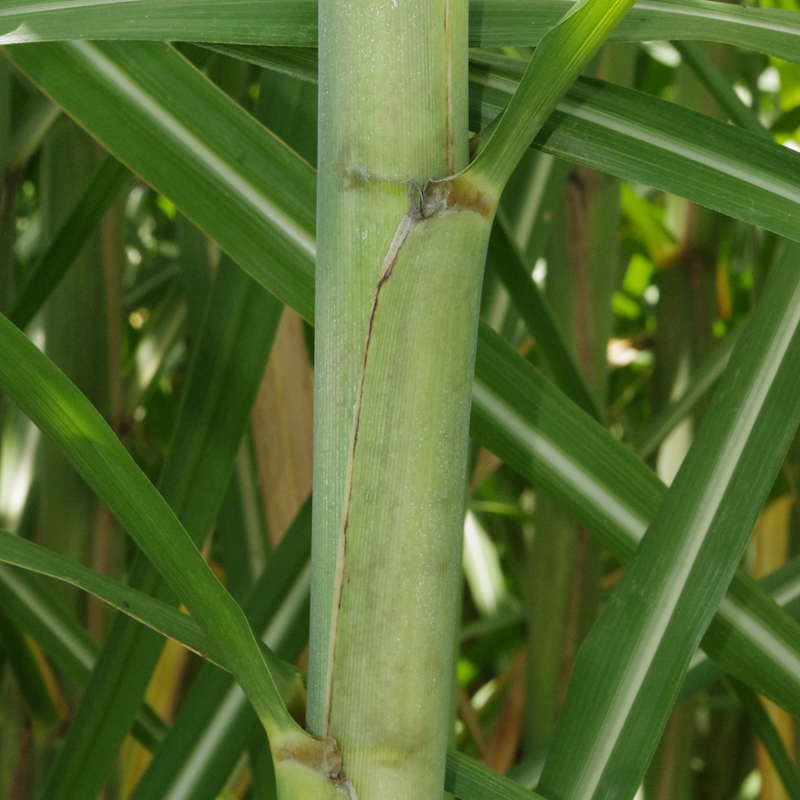 Stalk wax – Slight to moderate with overall yellowish to green appearance. 3. 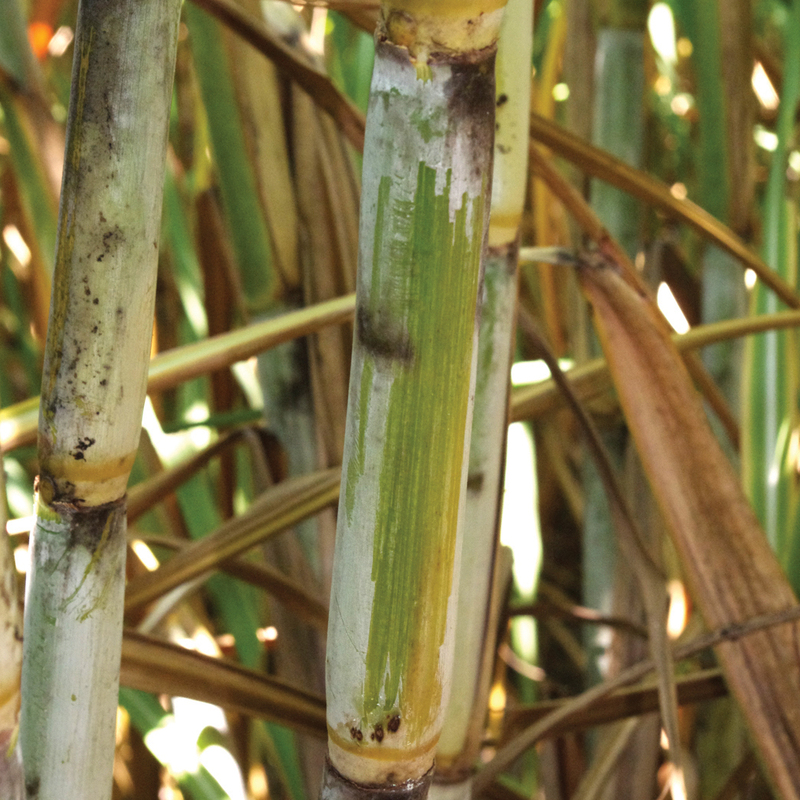 Stalk color under the wax layer – Yellowish green to green; with age, stalks become more bronze than HoCP 96-540. 5. Leaf sheath margin – Distinct necrotic leaf sheath margins. 6. Dewlap – Very light olive green. 7. Auricle – Slight to moderate in length; necrotic with obvious points; small tufts of hairs may be seen between the auricle and leaf collar. 8. 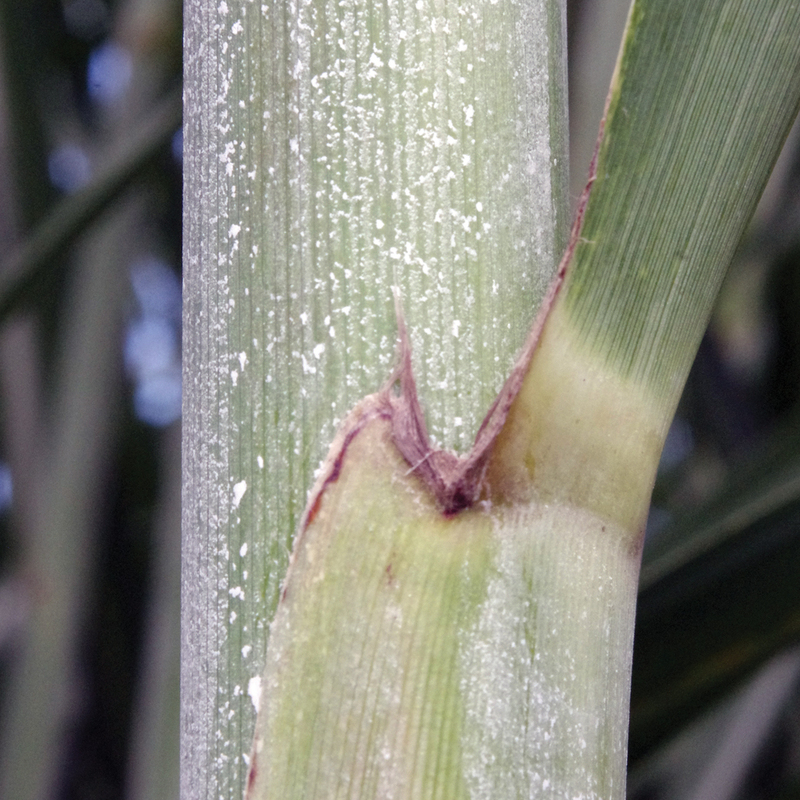 Distinguishing characteristics – Necrotic leaf sheath margins; cup shape leaf blade near the dewlap; distinct pointed auricle where present. Ho 05-961 was derived from a cross between CP 83-644 as the female parent and TucCP 77-42 as the male parent (Anonymous, 2012). The variety was released in 2012. 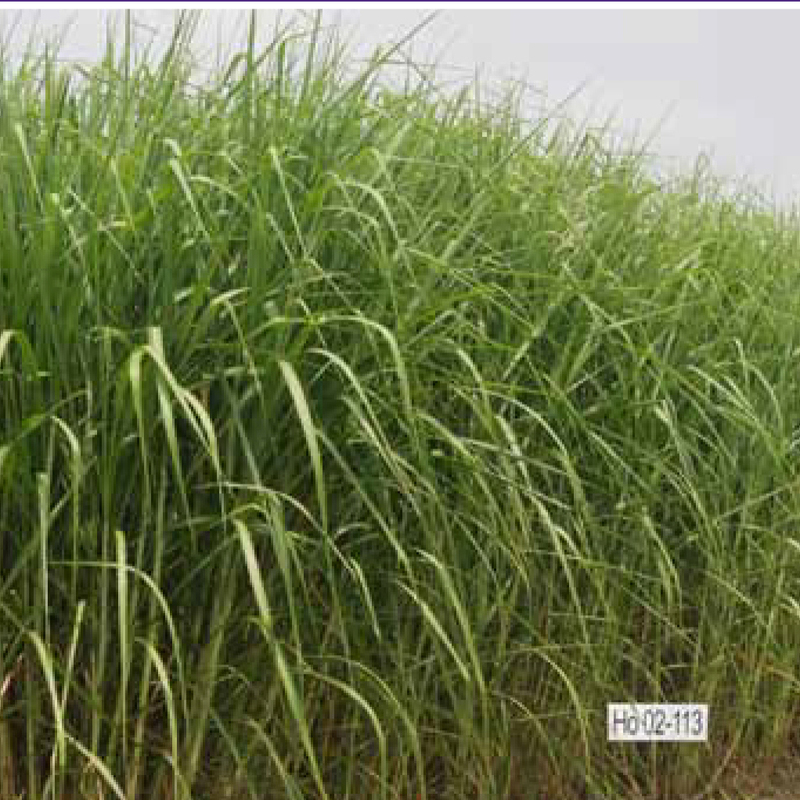 Ho 05-961 produces a high population of medium-sized stalks. The variety matures early, making it a good option for early harvest. The following pictures show eight different variety characteristics to help in identifying Ho 05-961. 1. Canopy – Drooping and spreading (similar to L 99-226). 3. 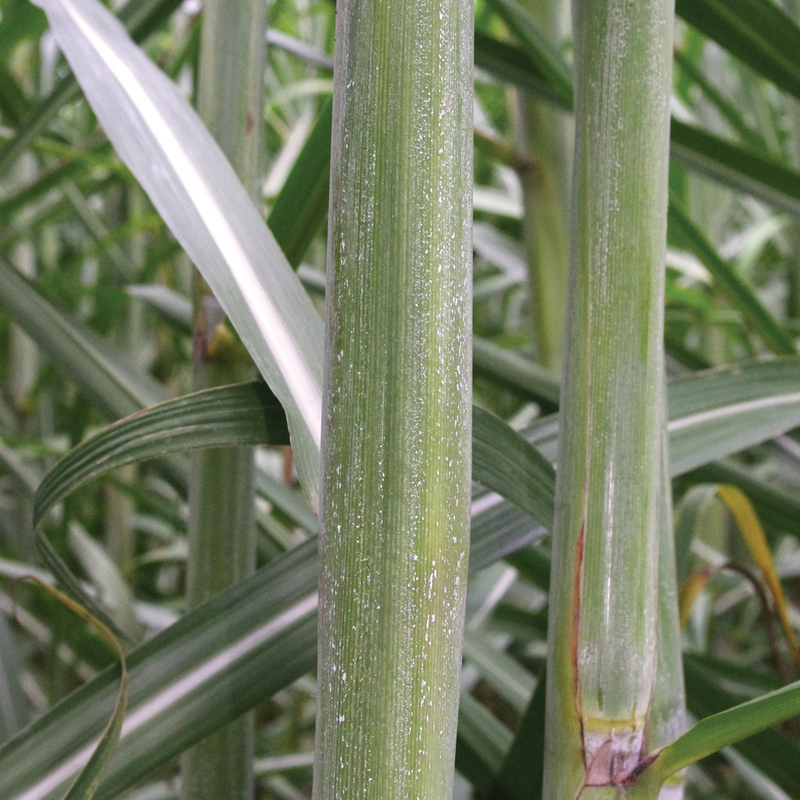 Stalk color under the wax layer – Predominantly green with yellowish hues. 4. 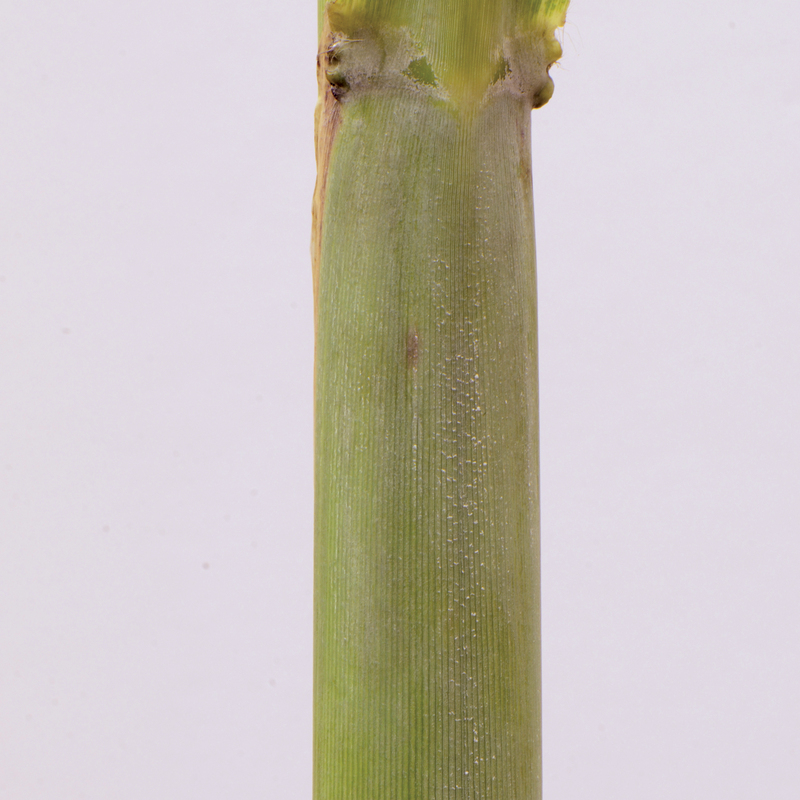 Leaf sheath – Very little wax and no pubescence (hairs). 5. 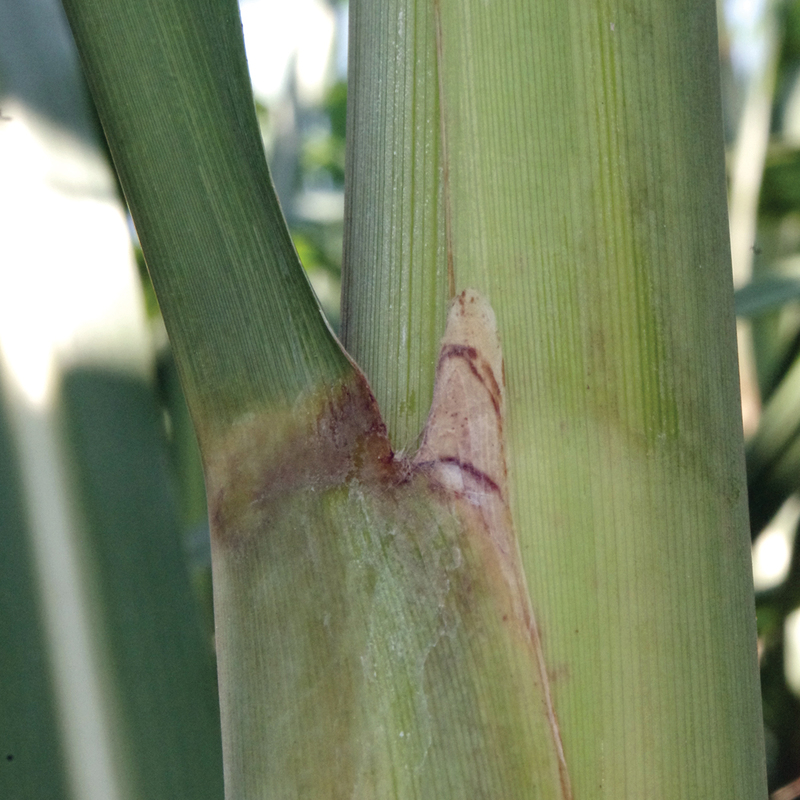 Leaf sheath margin – Reddish-purple margins. 6. Dewlap – Dark brown with reddish-purple hue. 7. Auricle – Slight to moderate, necrotic. 8. Distinguishing characteristic – Young plants have a yellowish hue even though properly fertilized, a spreading canopy and dark dewlaps. Ho 07-613 was derived from a cross made between HoCP 00-905 as the female parent and HoCP 96-540 as the male parent (Anonymous, 2014). The variety was released in 2014. HoCP 07-613 is early maturing and has good sugar yield in younger crops. The following pictures will show different characteristics to help identify Ho 07-613. 1. Canopy – Slightly erect to rounded. 2. 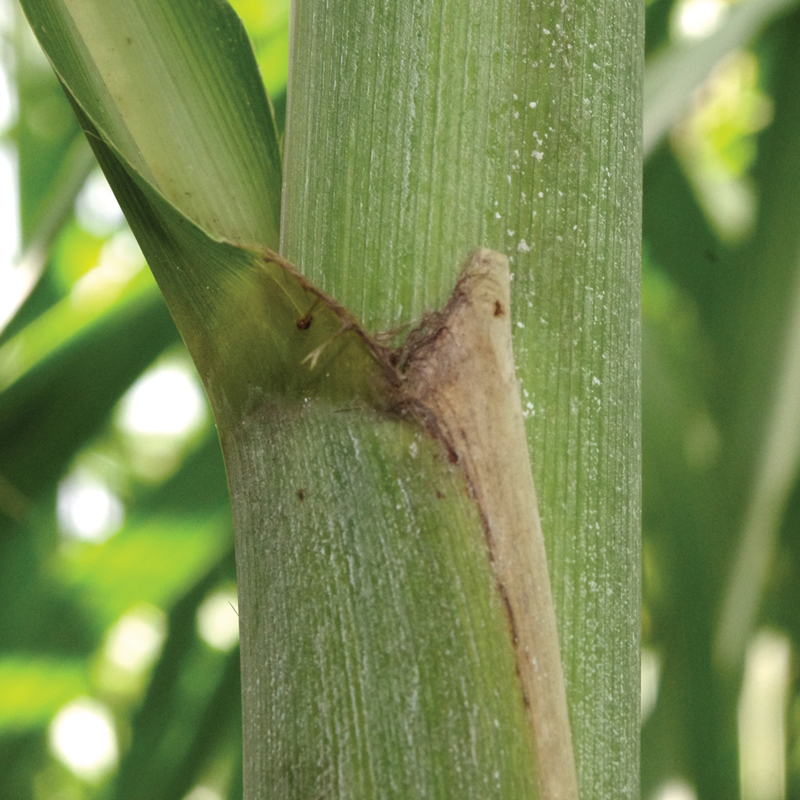 Stalk wax – Heavy layer of white wax; note occasional growth cracks. 3. 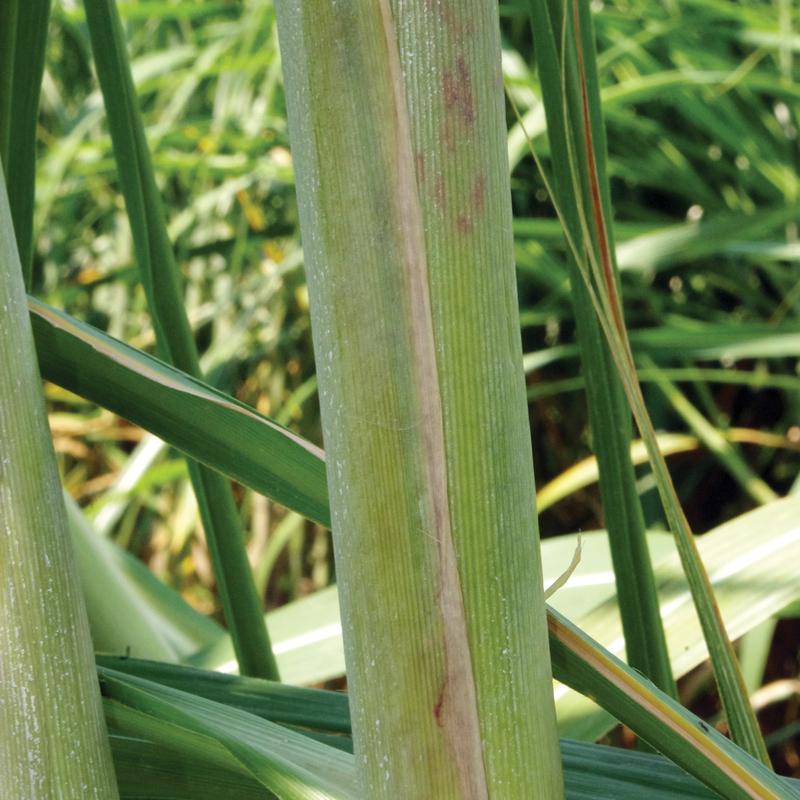 Stalk color under the wax layer – Green that becomes darker with exposure to the sun. 4. 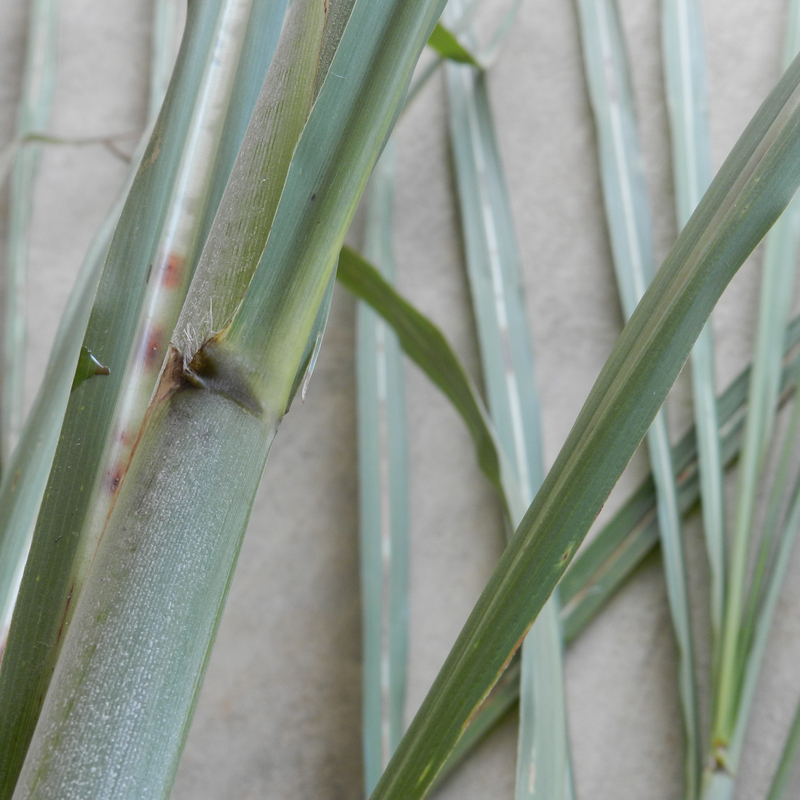 Leaf sheath – Light wax layer; smooth with a few pubescence hairs just opposite of the dewlap. 5. Leaf sheath margin – Generally darker reddish purple; margins become necrotic with age. 6. Dewlap – Dark brown (with reddish hues). 7. Auricle – Primarily absent; when present the auricles are slight and necrotic. 8. 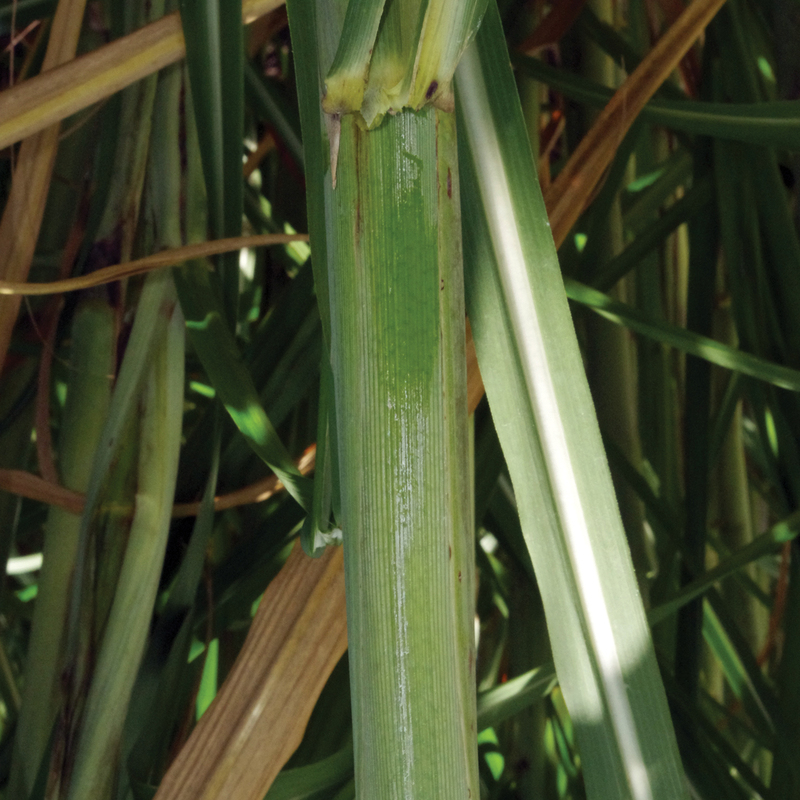 Distinguishing characteristics – Stalk has a heavy wax bloom; dark dewlap; dark leaf sheath margin; growth cracks; moderate population of medium-size stalks. HoCP 09-804 was derived from a cross made between HoCP 02-625 as the female parent and HoCP 01-523 as the male parent (Anonymous, 2016). The variety was released in 2016. HoCP 09-804 produces a high population of small-diameter stalks. The variety stubbles well, is early maturing and has good cold tolerance. The following pictures will show different characteristics to help identify HoCP 09-804. 2. 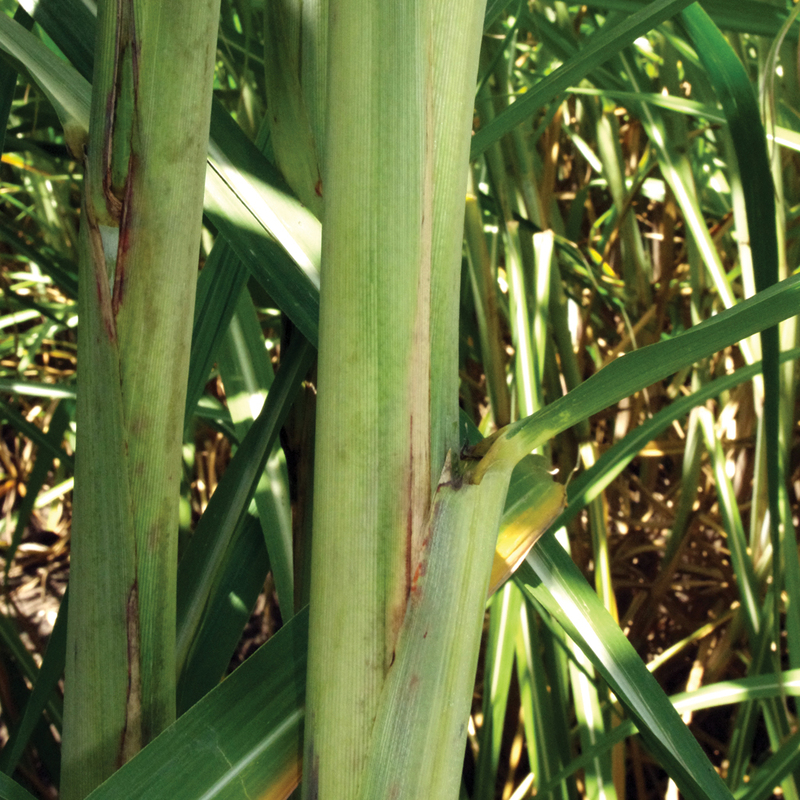 Stalk wax – Slight to moderate wax; the black color that can be prevalent is sooty mold from fungal growth. 3. 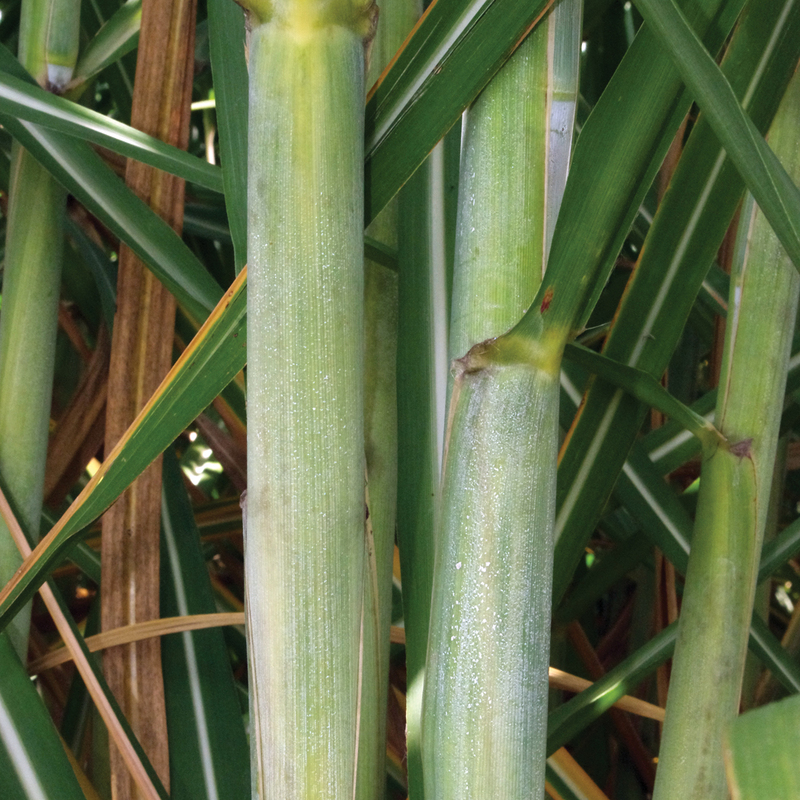 Stalk color under the wax layer – Yellowish green that becomes darker green with exposure to the sun. 4. Leaf sheath – Smooth (no pubescence). 5. 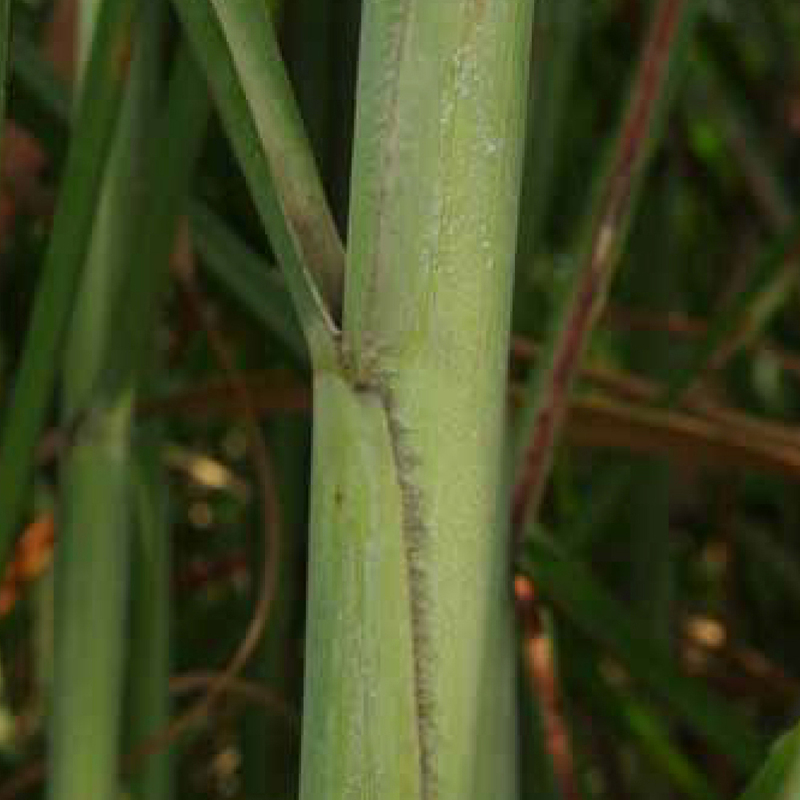 Leaf sheath margin – Generally green and similar to the leaf sheath. 6. Dewlap – Dark and becomes green at the base of the midrib of the leaf. 7. Auricle – Slight to none. 8. 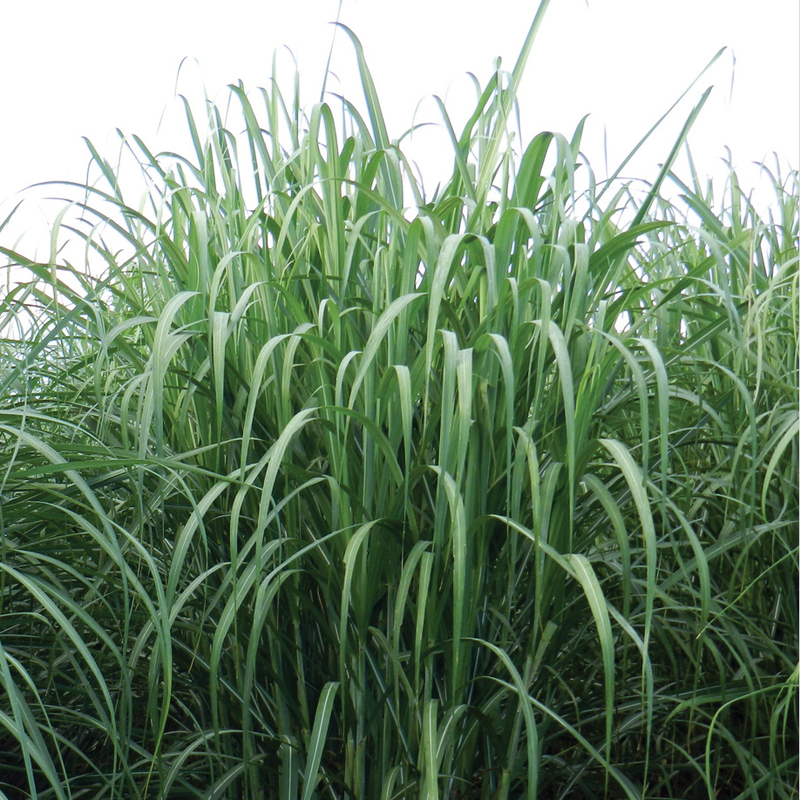 Distinguishing characteristics – Has the most erect canopy of any variety grown in Louisiana; has a high population of small-diameter stalks. L 11-183 was derived from a cross made between HoCP 92-624 as the female parent and HoCP 85-384 as the male parent. The variety was released in 2018. 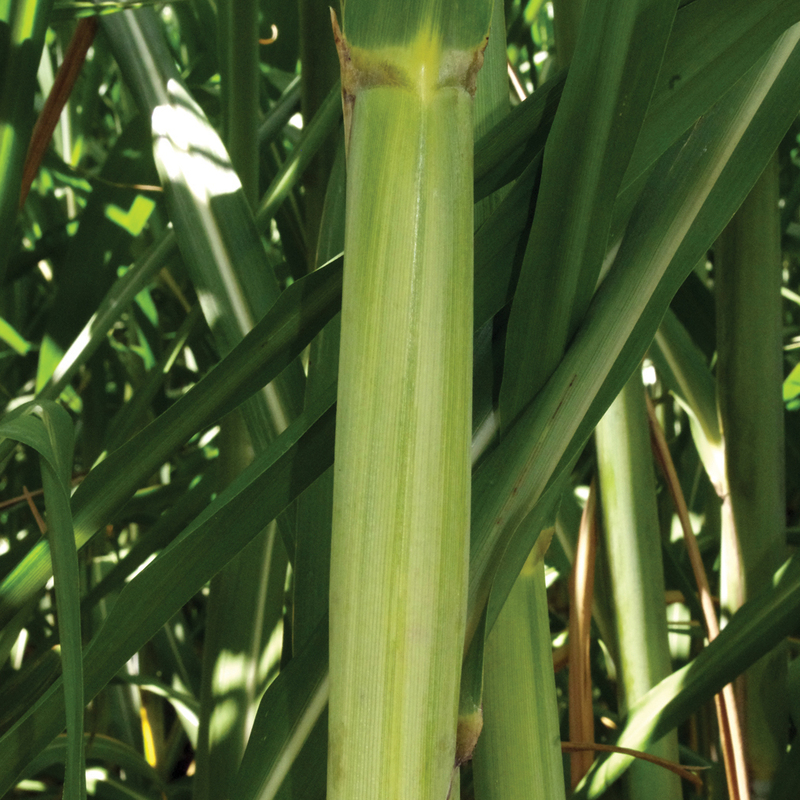 L 11-183 is a variety that produces a moderate population of medium-diameter stalks. The variety stubbles well, is midmaturing and has moderate cold tolerance. The following pictures will show different characteristics to help identify L 11-183. 1. Canopy – Drooping; excellent shading. 2. 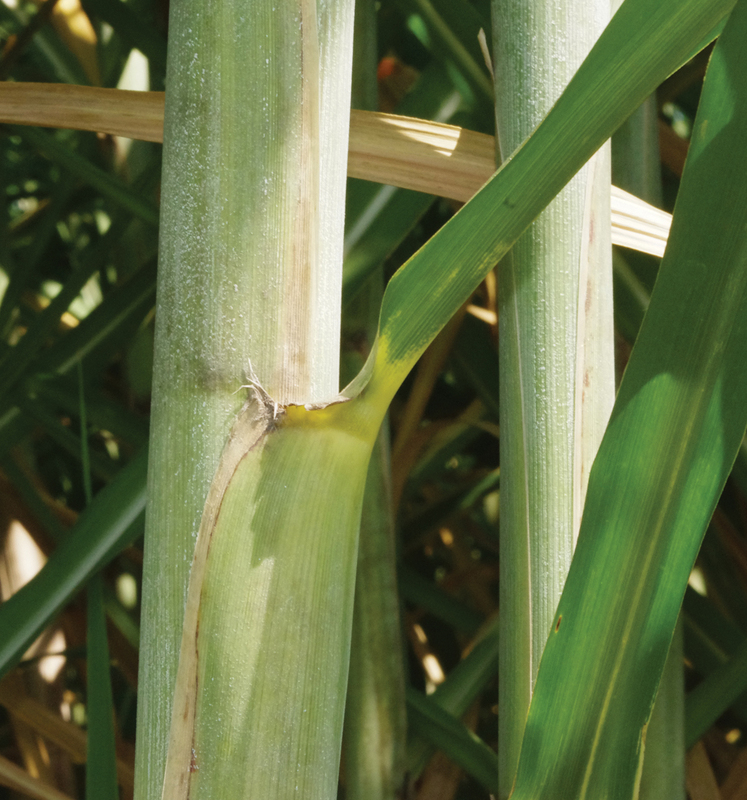 Stalk wax – Moderate to heavy wax. Black color may be sooty mold from fungal growth. Bud on the node is round and below the growth ring. Occasional slight bud groove on the internode. 3. 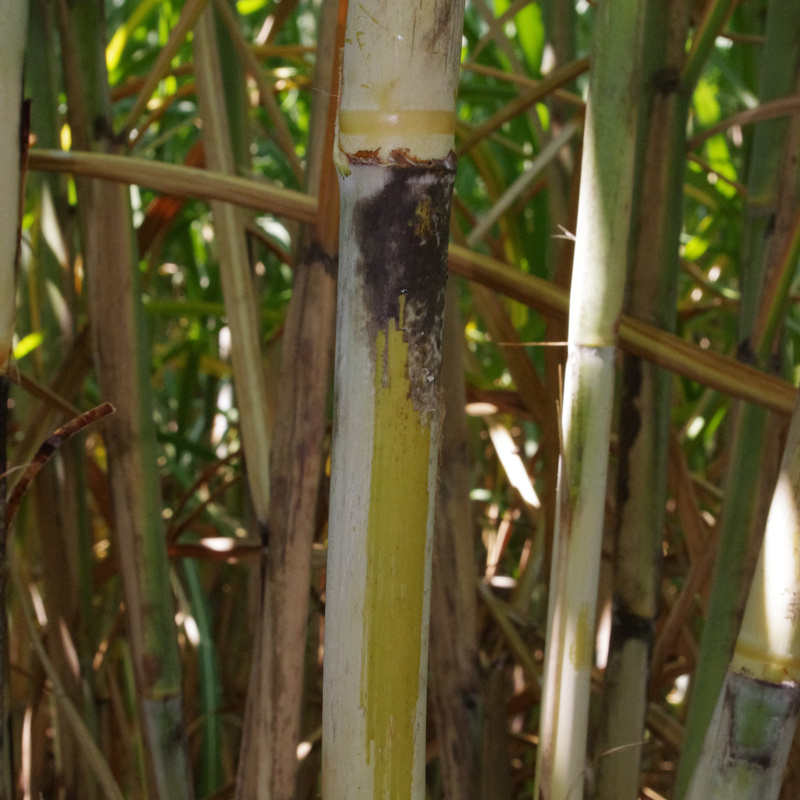 Stalk color under the wax layer – Yellowish green with green being predominant. 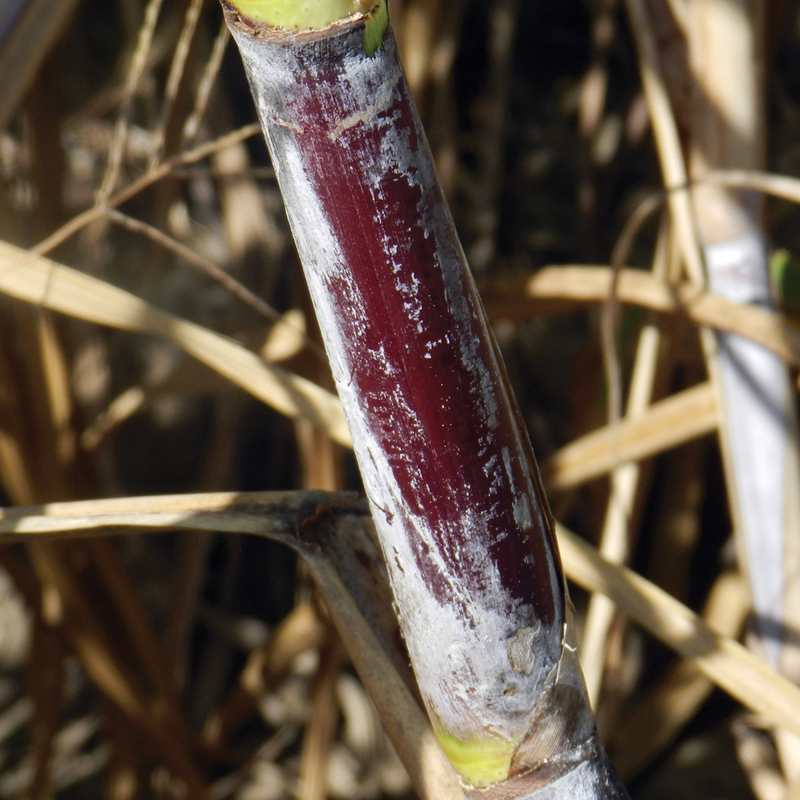 The stalk becomes a darker reddish-purple with exposure to the sun. 5. Leaf sheath margin – Generally necrotic (brown) and notably different from the green leaf sheath. 6. Dewlap – Mostly green. 7. Auricle – Primarily absent. When present, the auricle is necrotic and slight. 8. Distinguishing characteristics – Rolling, drooping canopy that shades the row better than L 01-299. Leaves are wider and greener than L 01-299. Dewlap of L 01-299 is darker than L 11-183. 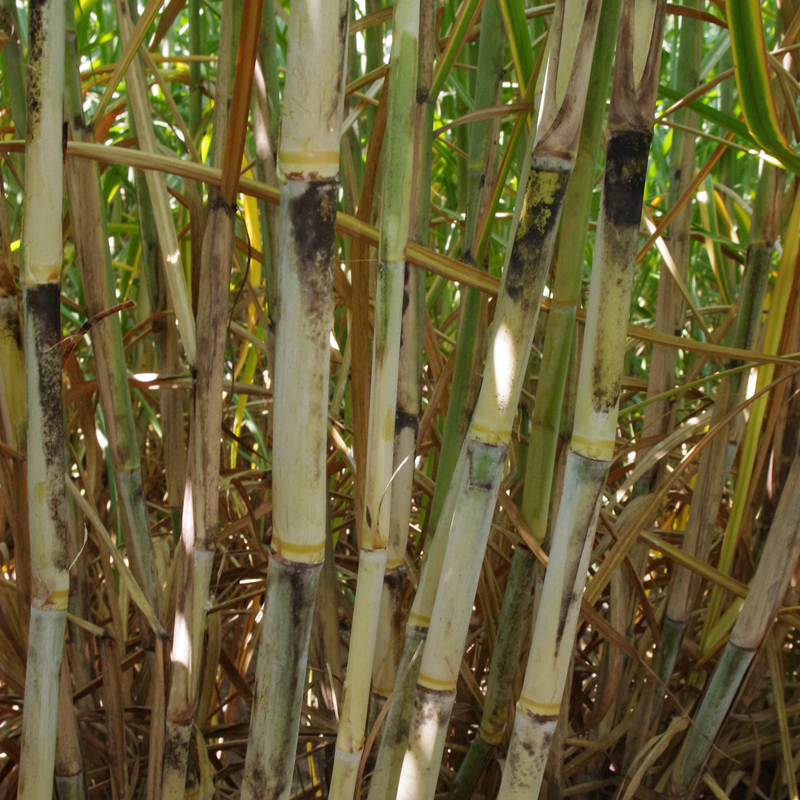 Ho 02-113 is a high-fiber-content and low-sucrose-content sugarcane variety that can be used as a feedstock for the production of biofuels. 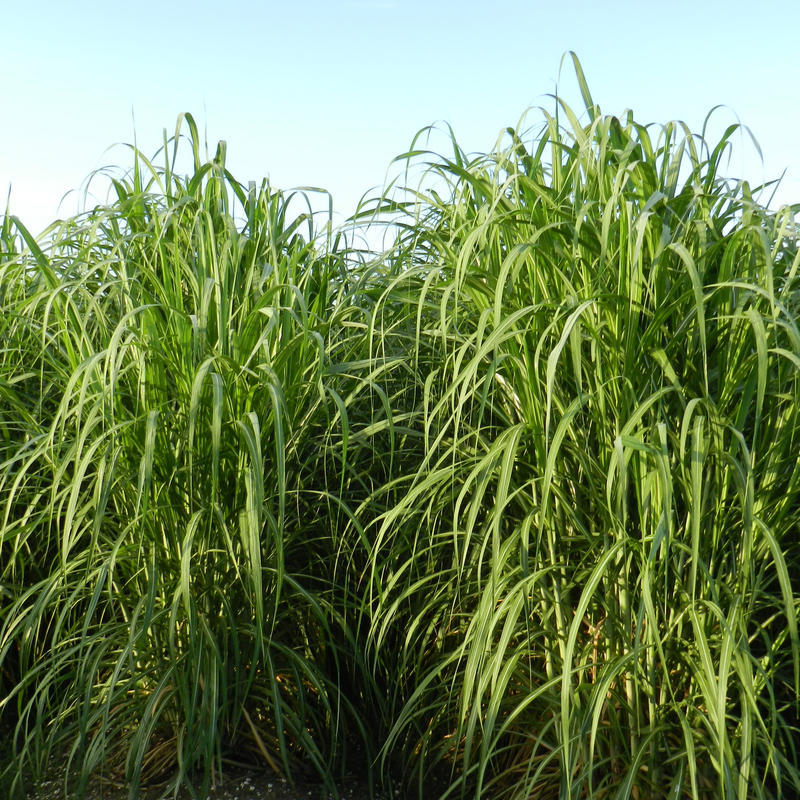 The female parent of Ho 02-113 is SES 234 (Saccharum spontaneum), and the male parent is LCP 85-384, a commercial sugarcane variety. 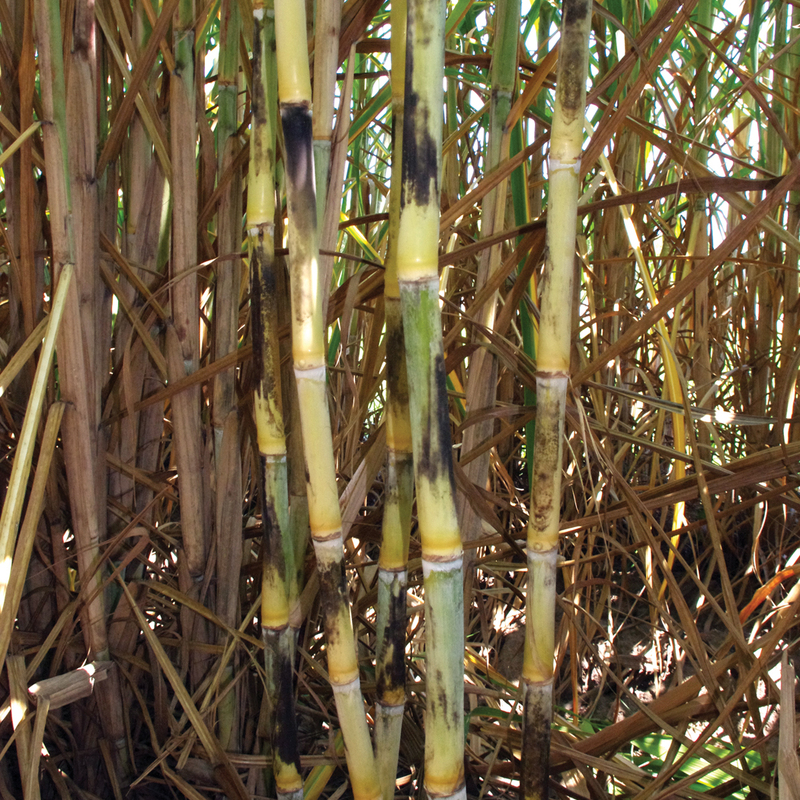 Ho 02-113 was released in 2010 and has an extremely high population of small-diameter stalks, which is typical of clones derived from Saccharum spontaneum. The canopy is very erect, and the variety has excellent vigor and stubbling ability. 2. 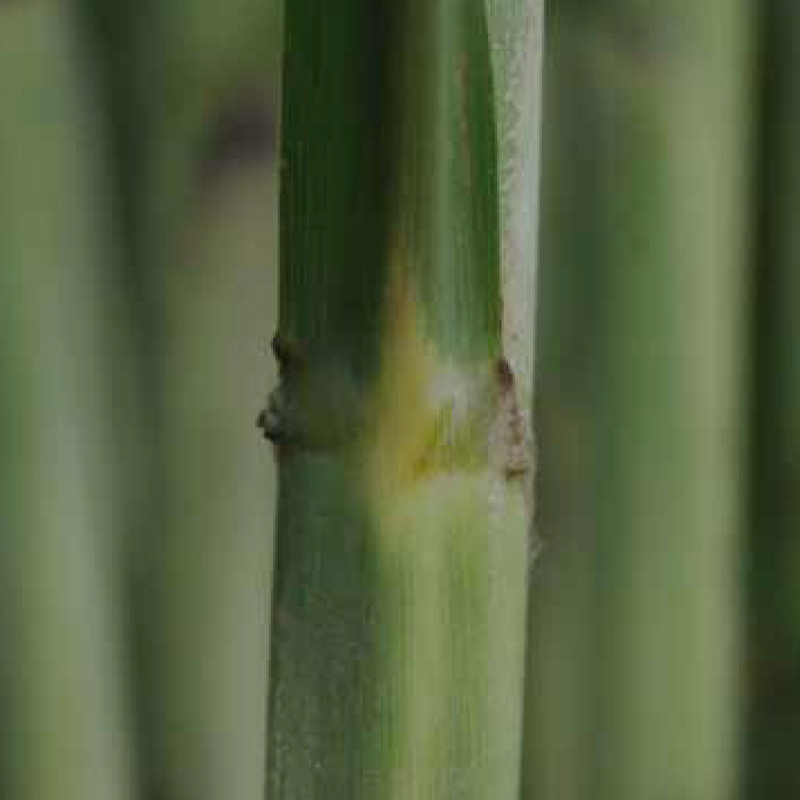 Stalk wax – Moderate to high amount of wax. 3. 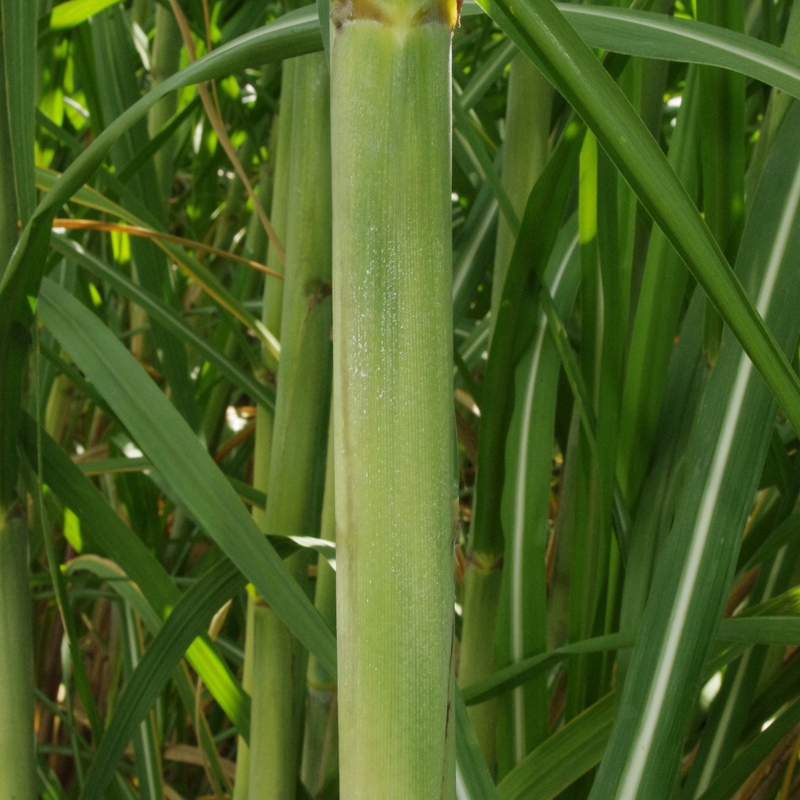 Stalk color under the wax layer – Predominantly green with some yellow hues. 5. 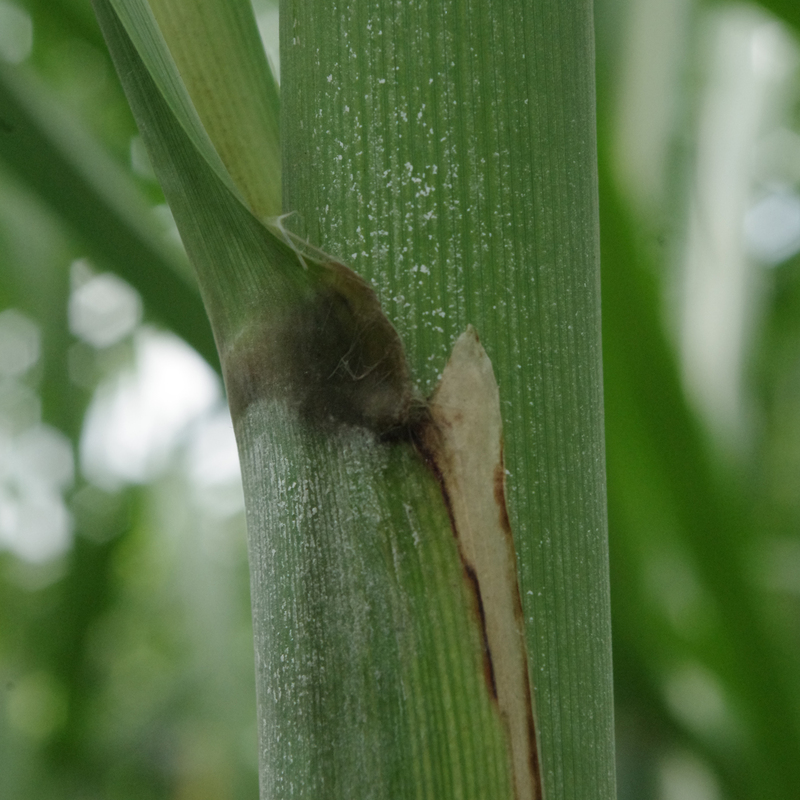 Leaf sheath margin – Many leaf sheath margins have a high amount of pubescence. 6. Dewlap – Light green to yellow. 7. Auricle – Very slight; some can have high levels of pubescence. 8. 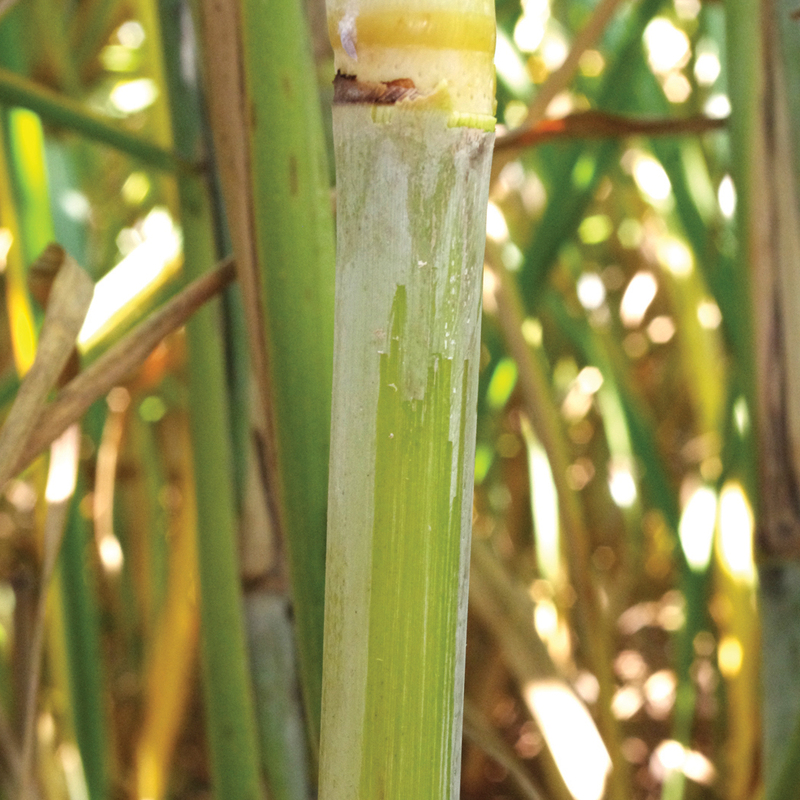 Distinguishing characteristics – High population of small-diameter stalks; variety can show rhizomatous growth that contributes to profuse tillering. Anonymous. 2011. 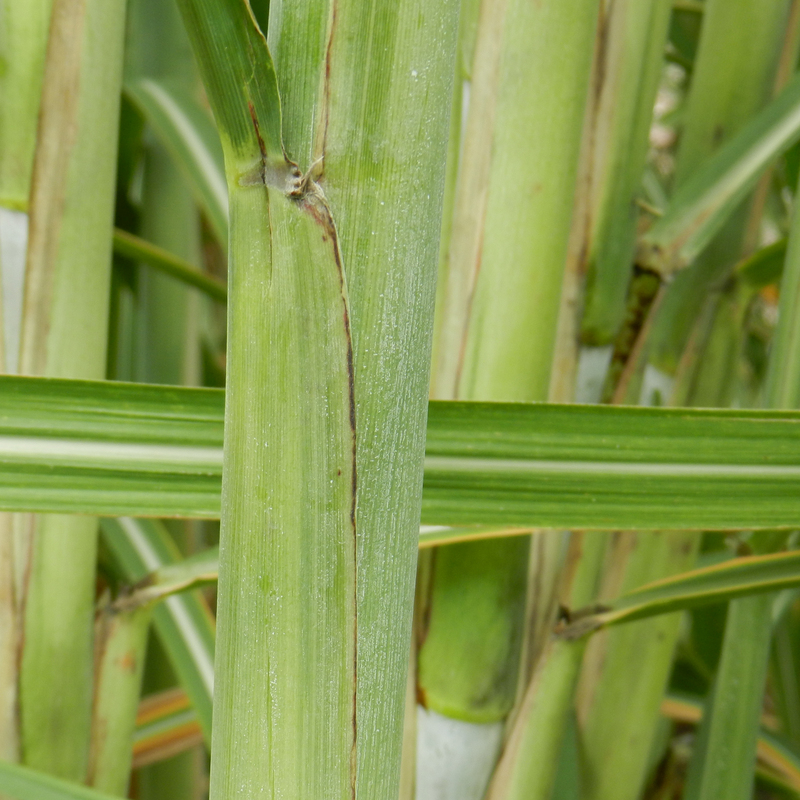 Notice of Release of Sugarcane Variety HoCP 04-838. Sugar Bulletin. 89(10):19-21. Anonymous. 2014. 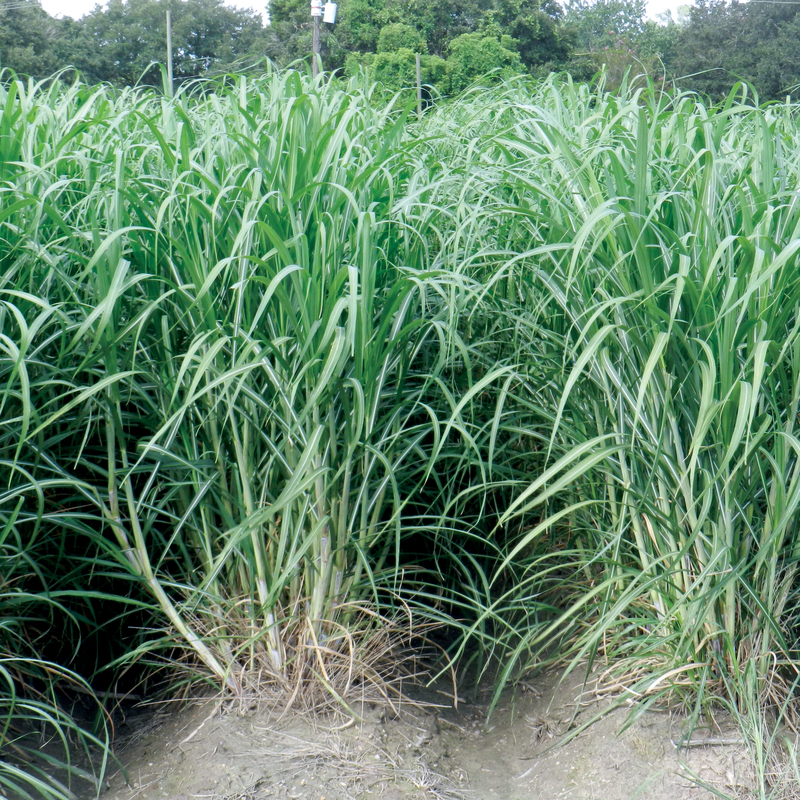 Notice of Release of Sugarcane Variety Ho 07-613. Sugar Bulletin. 92(10):19-21. Anonymous. 2016. 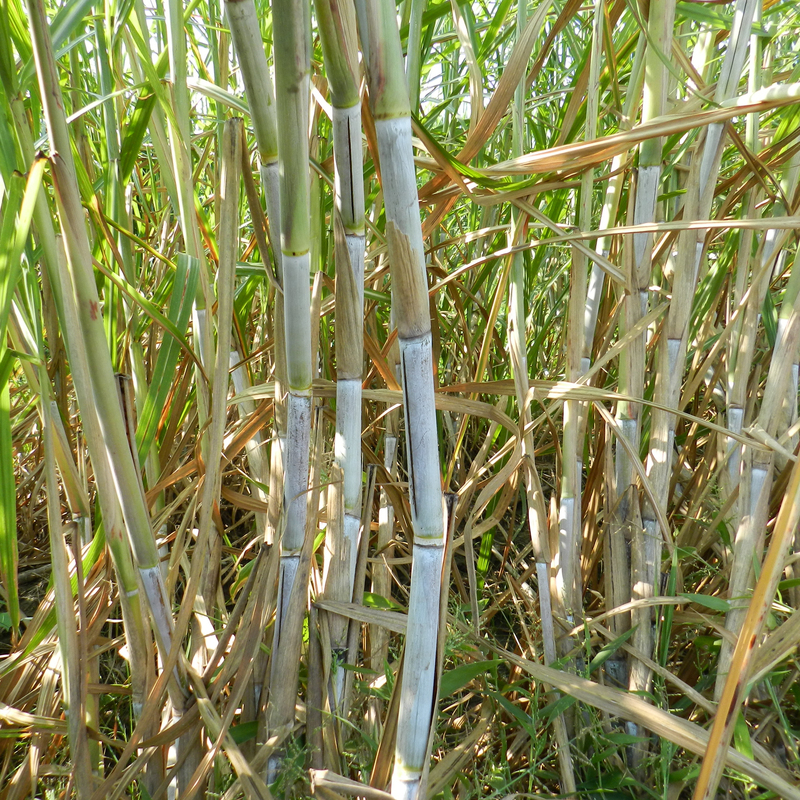 Notice of Release of Sugarcane Variety HoCP 09-804. Sugar Bulletin. 94(10):17-19. Anonymous. 2018. 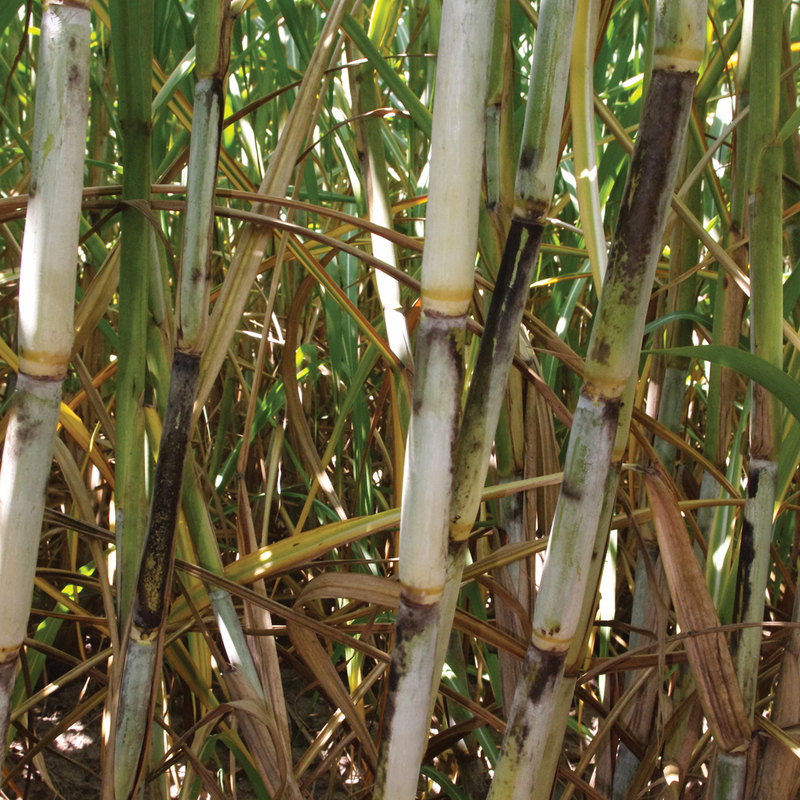 Notice of Release of Sugarcane Variety L 11-183. Sugar Bulletin. 96(10):17-19. Bischoff, K.P., K.A. Gravois, T.E. Reagan, J.W. Hoy, C.M. LaBorde, C.A. Kimbeng, G.L. Hawkins, and M.J. Pontif. 2009. 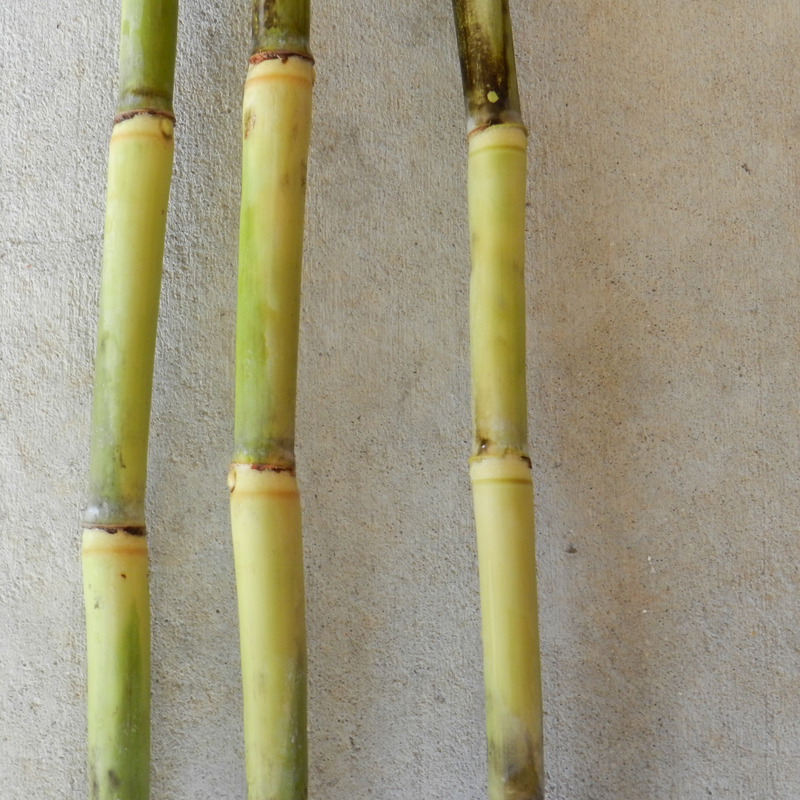 Registration of ‘L 99-226’ Sugarcane. J. Plant Reg. 3:241-247. 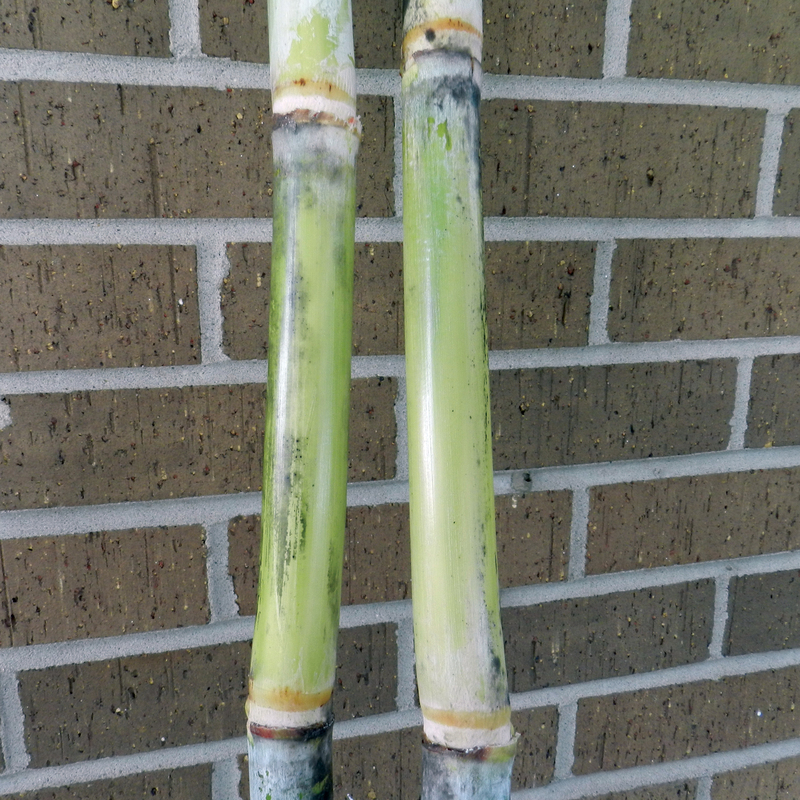 Blackburn, F. Sugar-cane. 1984. Longman. New York, N.Y.
Gravois, K.A., K.P. Bischoff, C.M. LaBorde, J.W. Hoy, T.E. Reagan, M.J. Pontif, C.A. Kimbeng, G.L. Hawkins, D.R. Sexton, D.P. Fontenot. 2010. Registration of ‘L 01-283’ Sugarcane. J. Plant Reg. 4:183-188. Gravois, K. A., K. P. Bischoff, M. J. Pontif, C. M. LaBorde, J. W. Hoy, T. E. Reagan, C. A. Kimbeng, B. L. Legendre, G. L. Hawkins, D. R. Sexton and D. P. Fontenot. 2011. 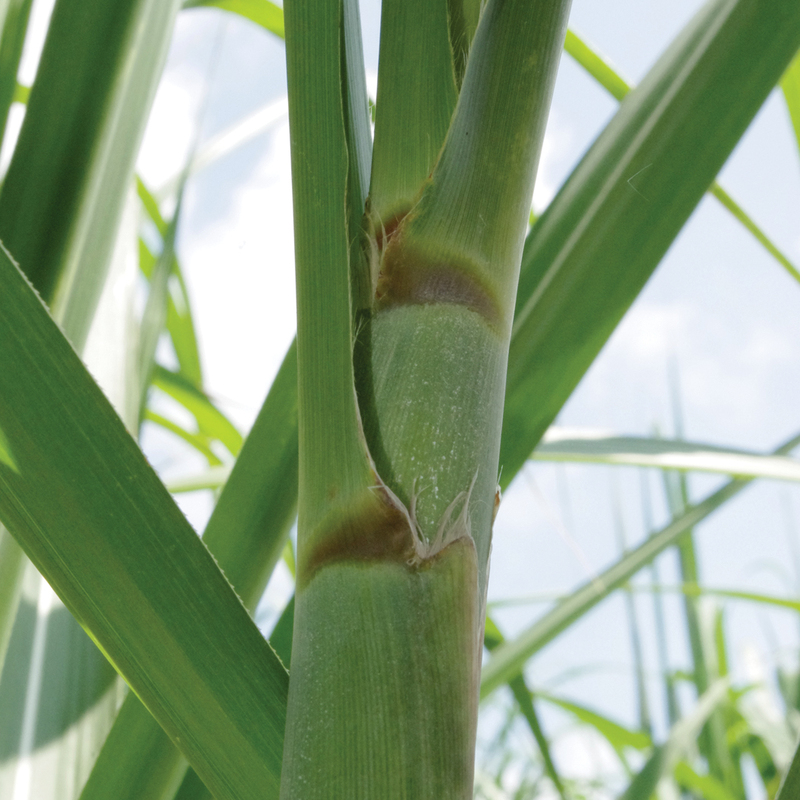 Registration of ‘L 01-299’ Sugarcane. J. Plant Reg. 5:191-195. Gravois, K. A., K. P. Bischoff, J.W. Hoy, T.E. Reagan, M. J. Pontif, C. A. Kimbeng, G. L. Hawkins, D. P. Fontenot, and D.R. Sexton. 2012. 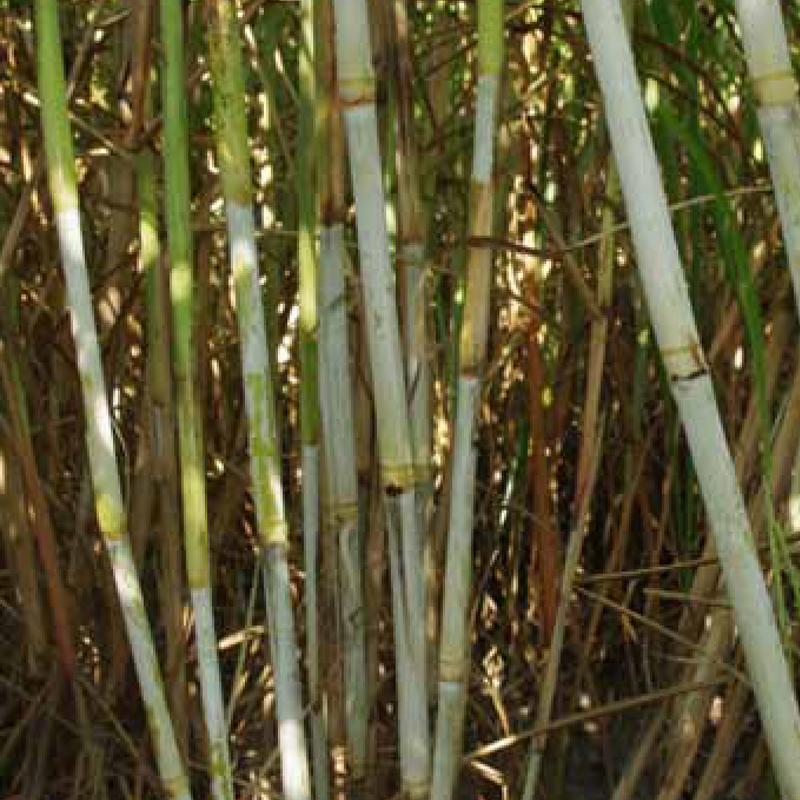 Registration of ‘L 03-371’ Sugarcane. J. Plant Reg. 6:31-36. Gravois, K.A., and B.L. Legendre. 2016. 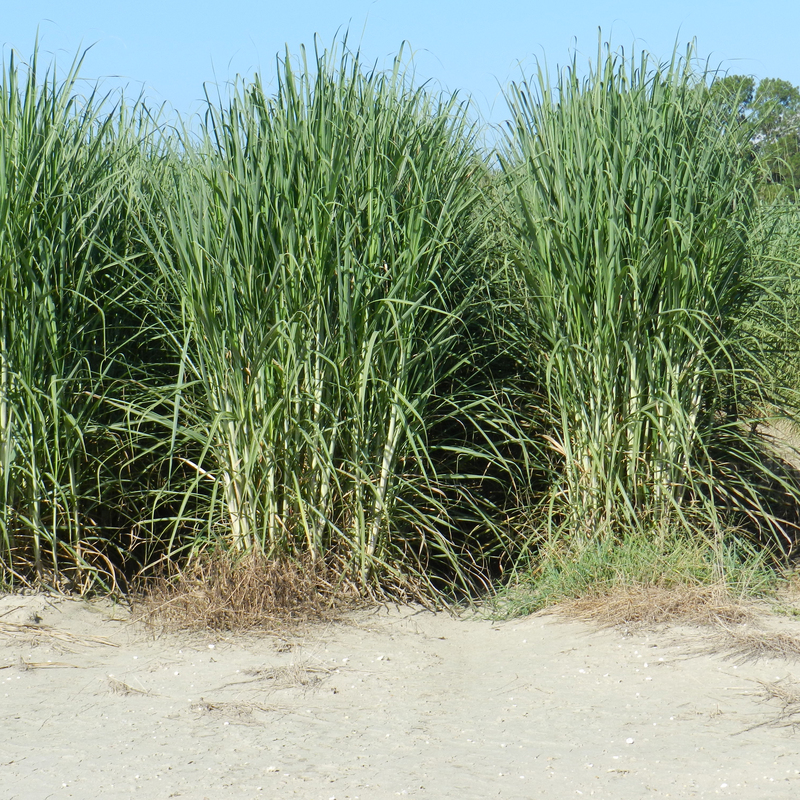 The 2015 Louisiana Sugarcane Variety Survey. Sugar Bulletin. 94(9):21-24. Jackson, W.R. 2012. On the Farm. Sugar Bulletin. 90(9):11-16. Tew, T.L., W.H. White, M.P. Grisham, E.O. Dufrene Jr, D.D. Garrison, J.C. Veremis, Y. Pan, E.P. Richard Jr., B.L. Legendre, and J.D. Miller. 2005. 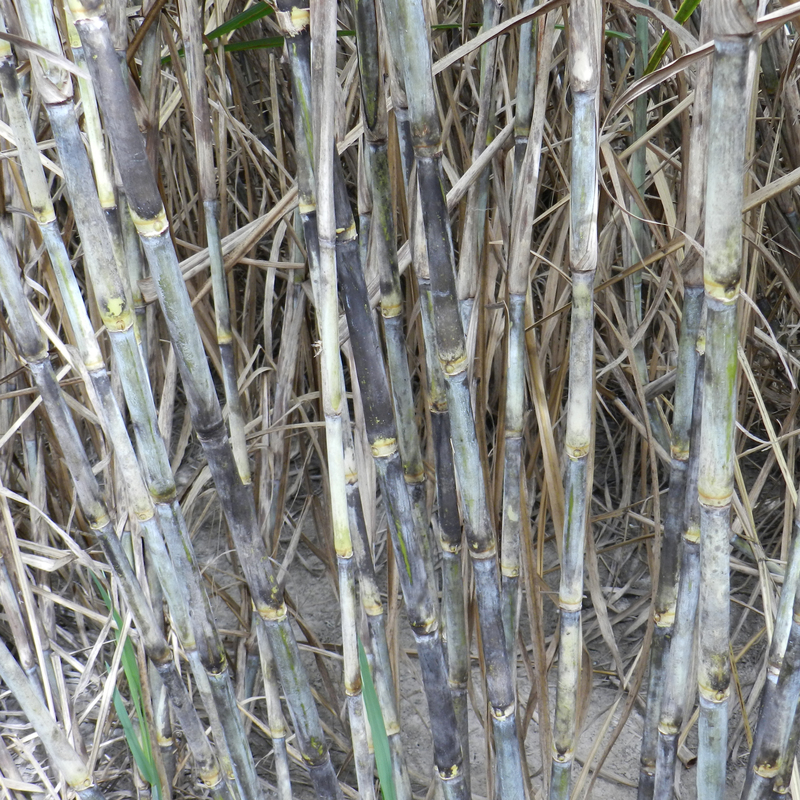 Registration of ‘HoCP 96-540’ Sugarcane. Crop Sci. 45:785-786. Tew, T.L., E.O. Dufrene Jr., D.D. Garrison, W.H. White, M.P. Grisham, Y. Pan, E.P. Richard Jr., B.L. Legendre, and J.D. Miller. 2007. 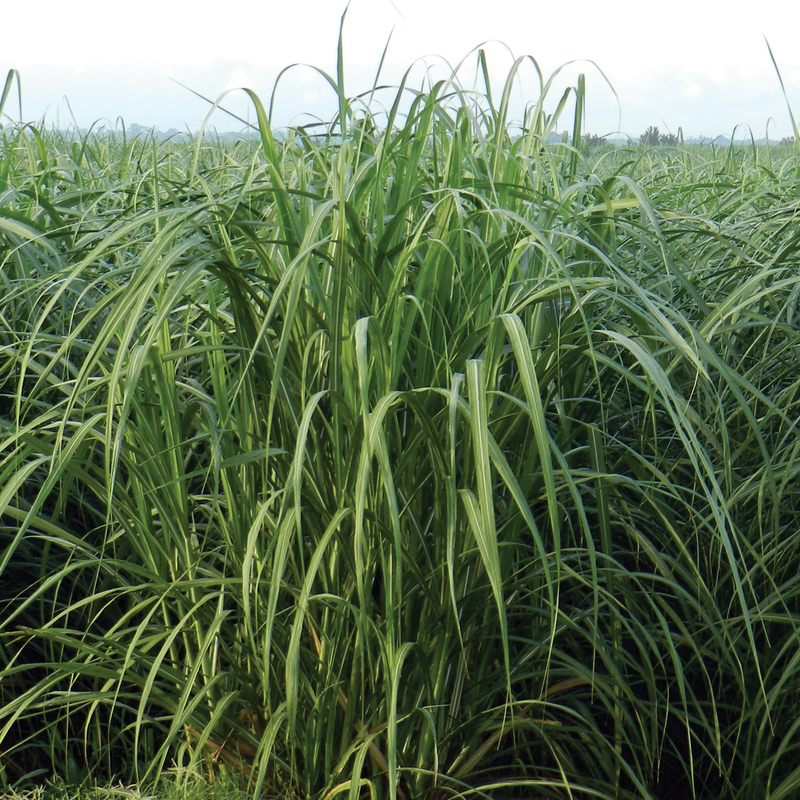 Notice of Release of Sugarcane Variety ‘HoCP 00-950’. Sugar Bulletin. 85(9):21-23.